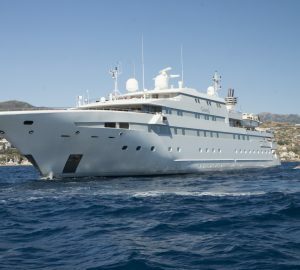 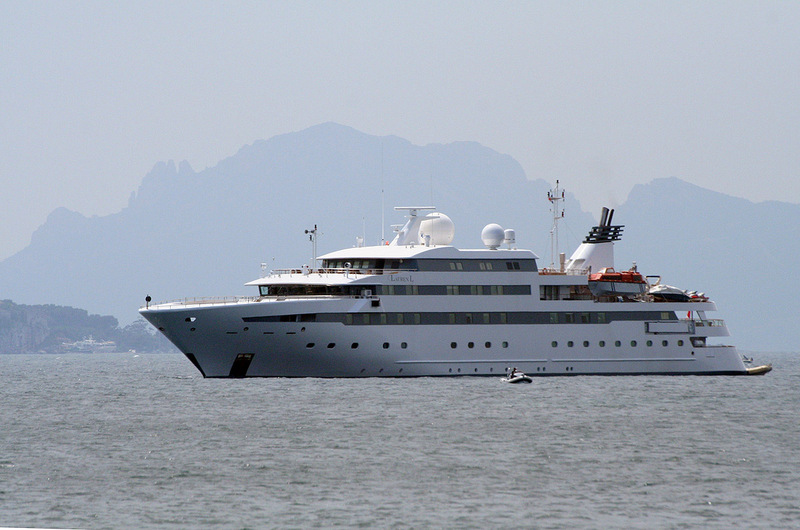 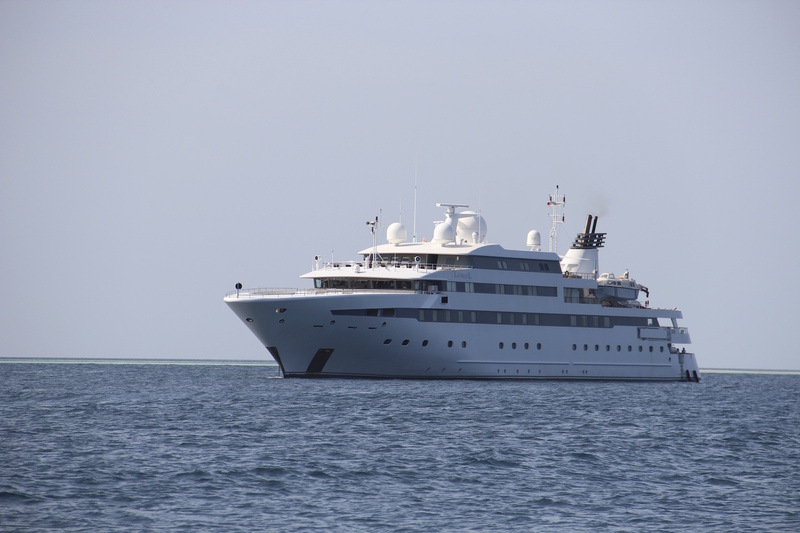 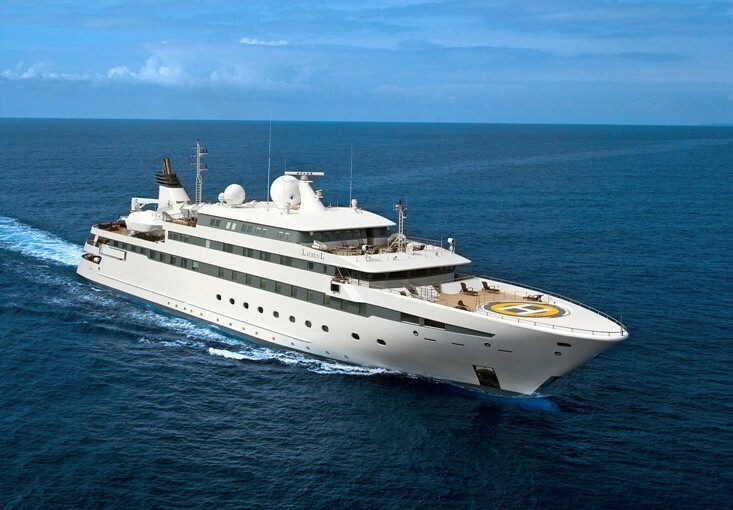 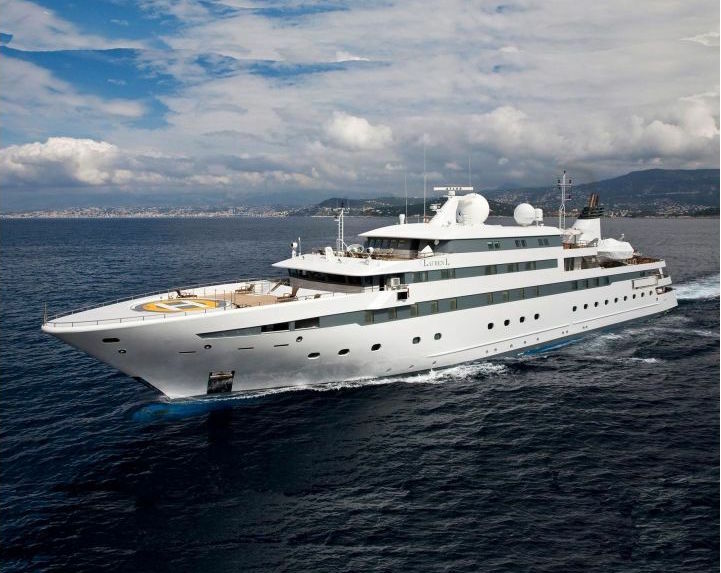 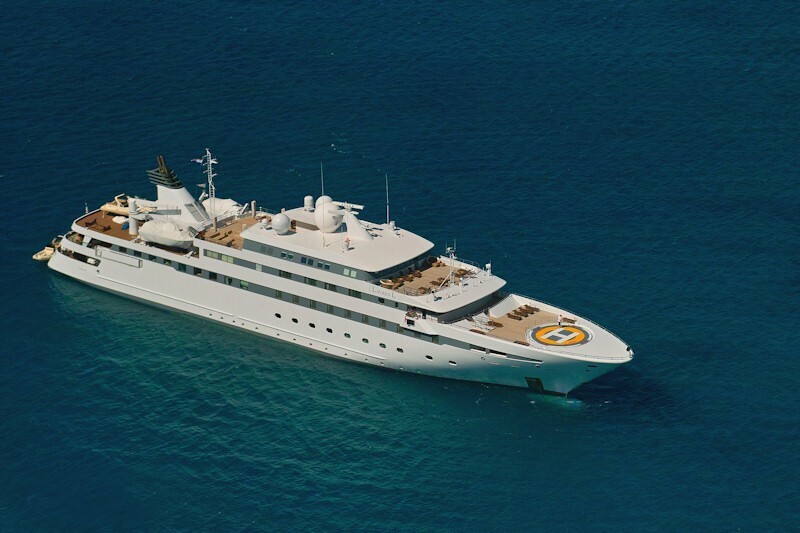 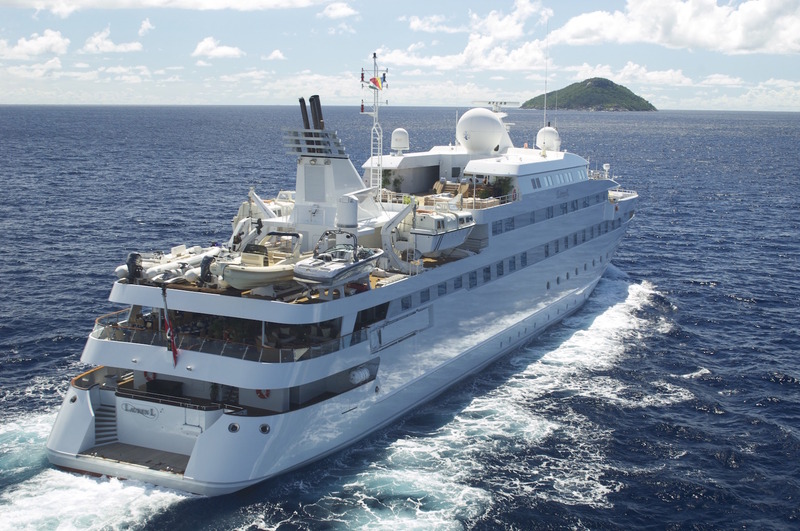 90m/295ft mega yacht LAUREN L (ex.CONSTELLATION) was built by Cassens-Werft in 2002 and her naval architecture is the work of Alpha Marine. 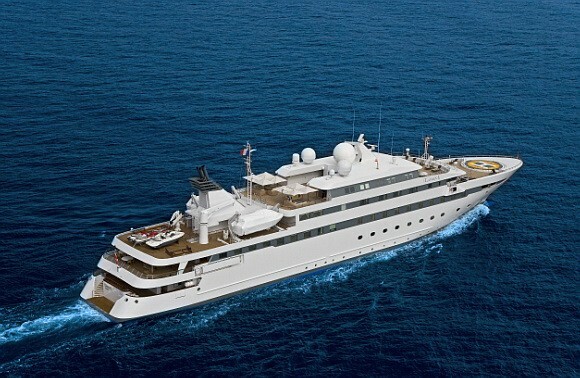 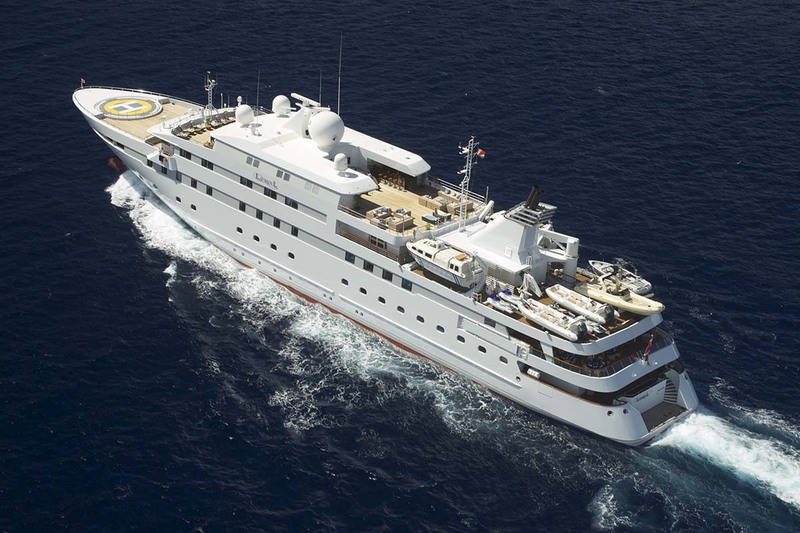 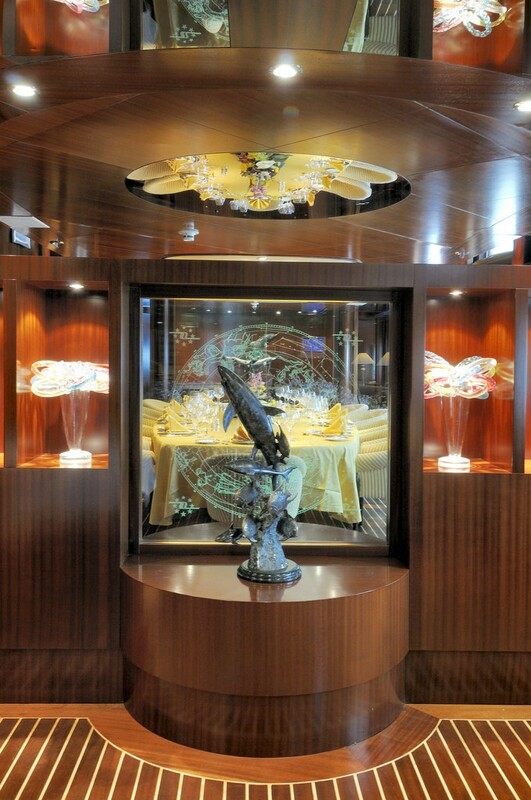 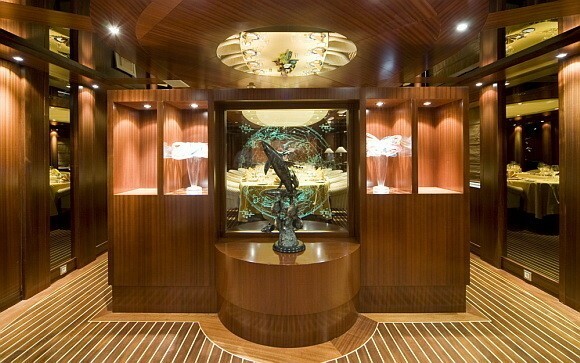 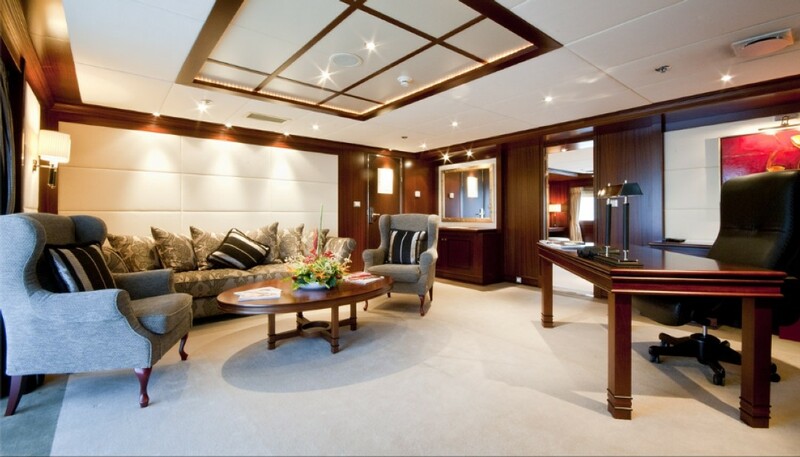 Cassens-Werft also completed her exterior styling and while her interior is the work of Alpha Marine. 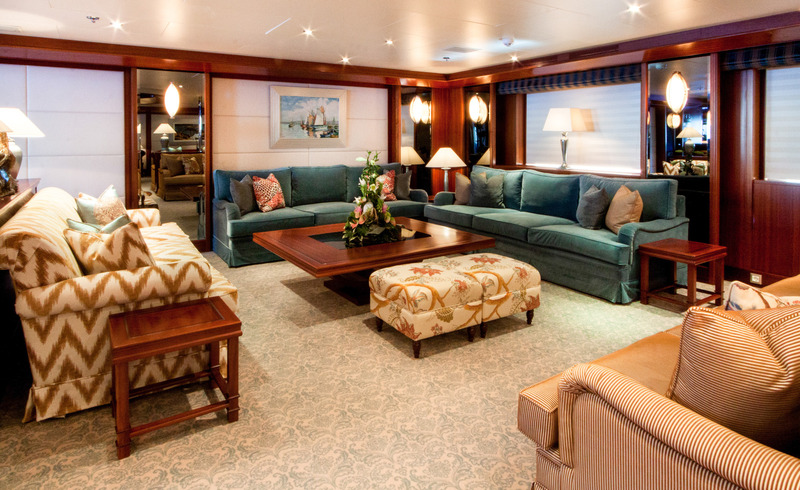 At dockside events she can accommodate up to 300 guests across four decks, and her accommodation provides for up to 36 guests in 20 beautifully-appointed cabins. 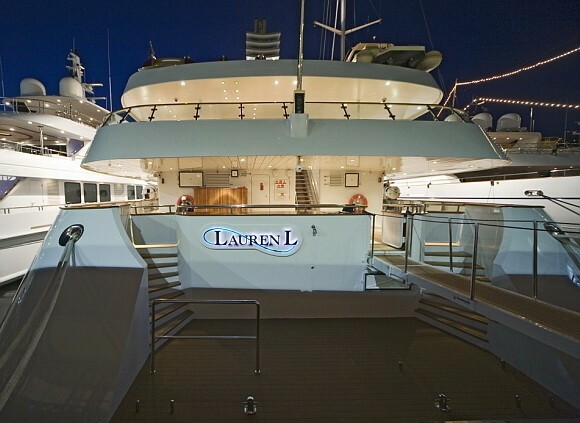 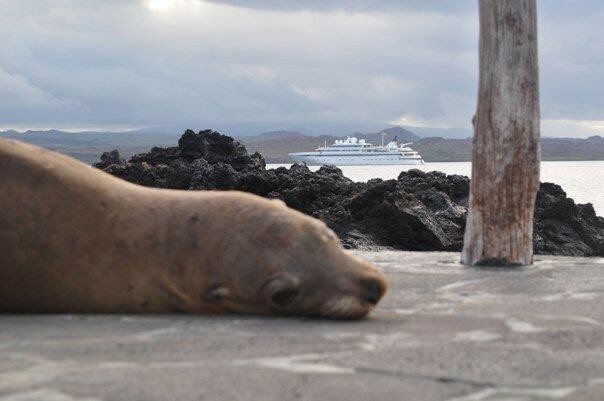 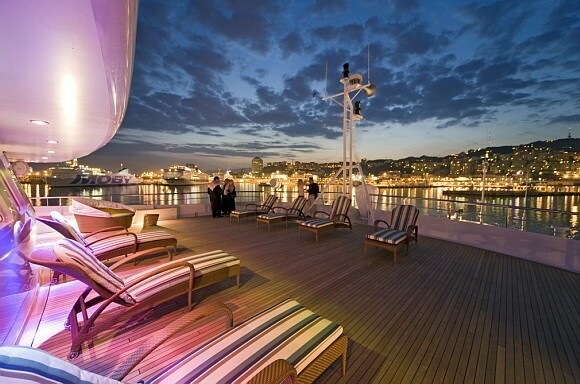 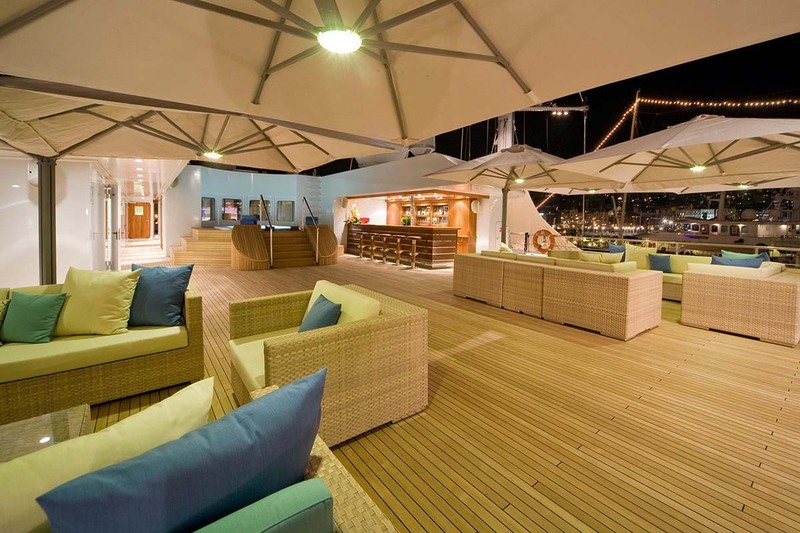 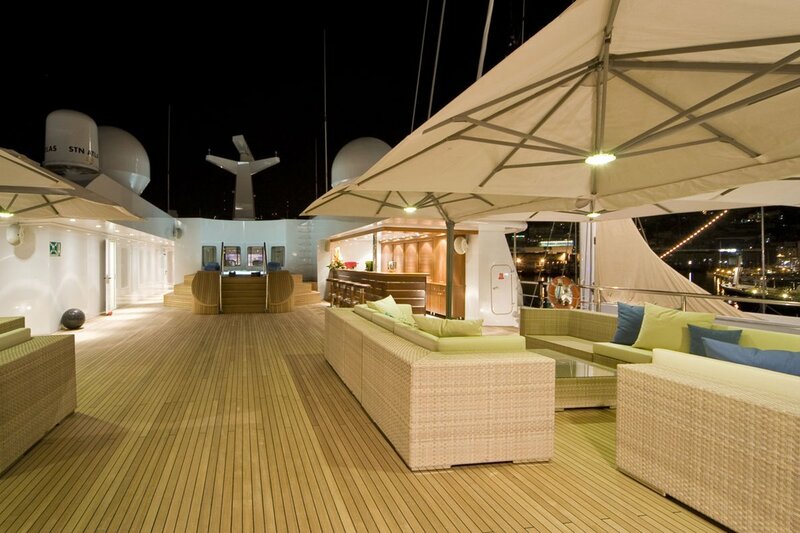 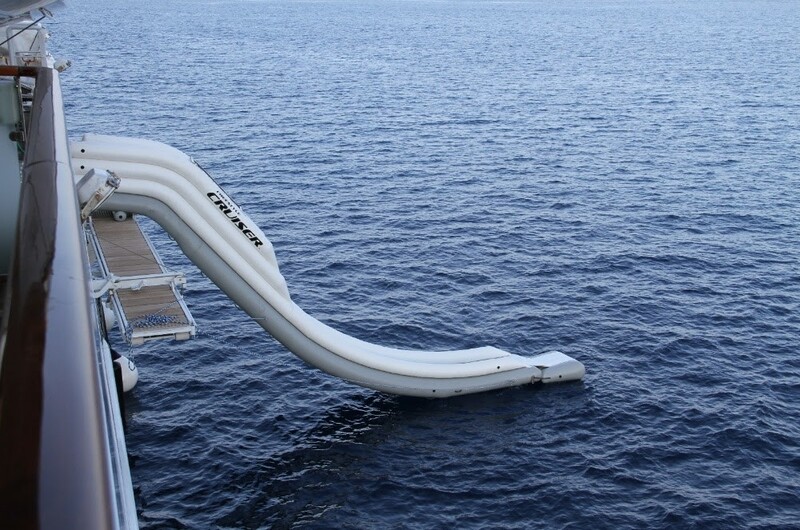 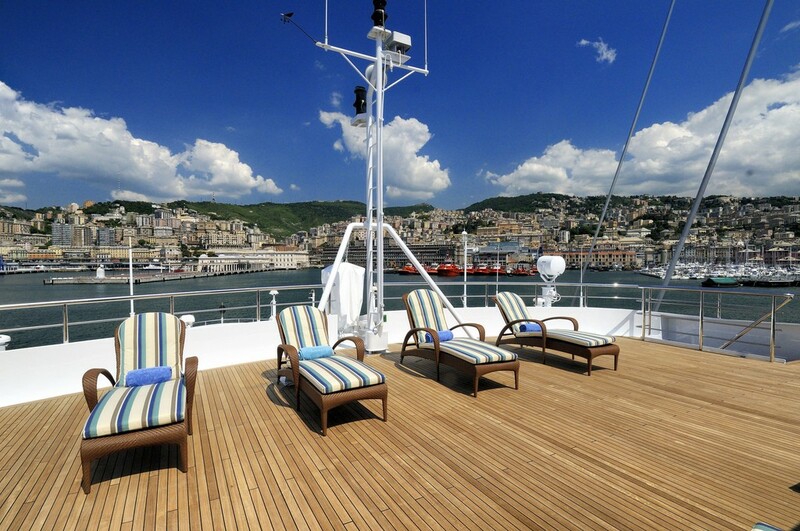 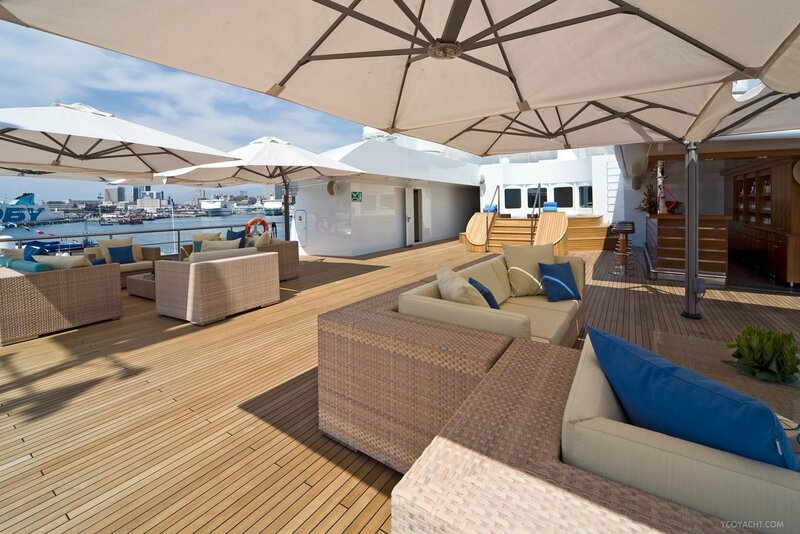 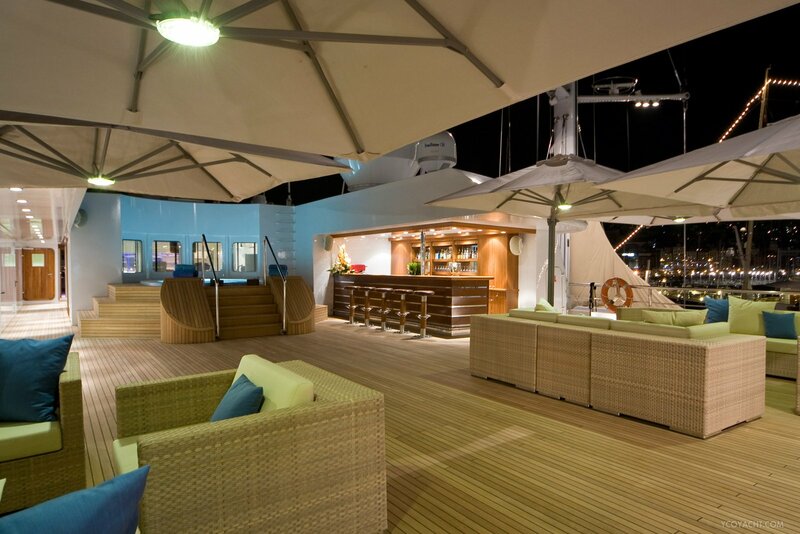 The lower deck can be used as a sunbathing area as well as a place to board and disembark from the tenders. 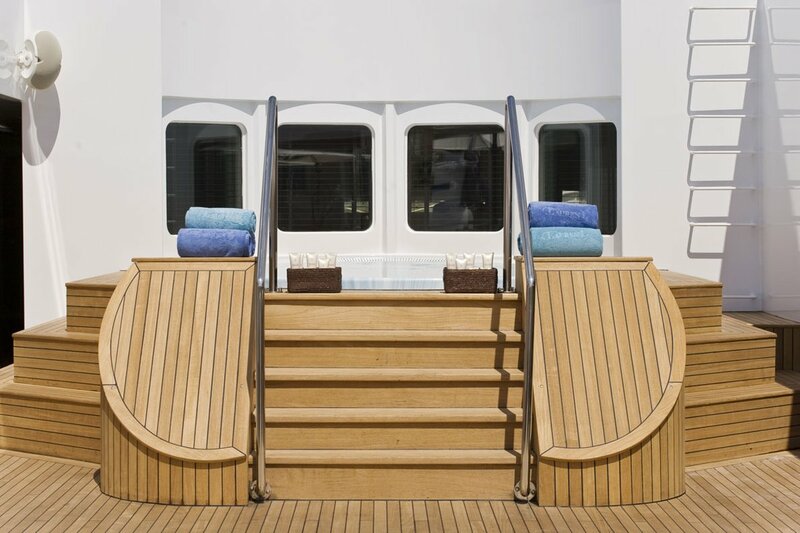 Staircases lead up to the shaded main deck aft, where there is a broad stern seating area for guests to spend time outdoors with the views while waiting for transport. 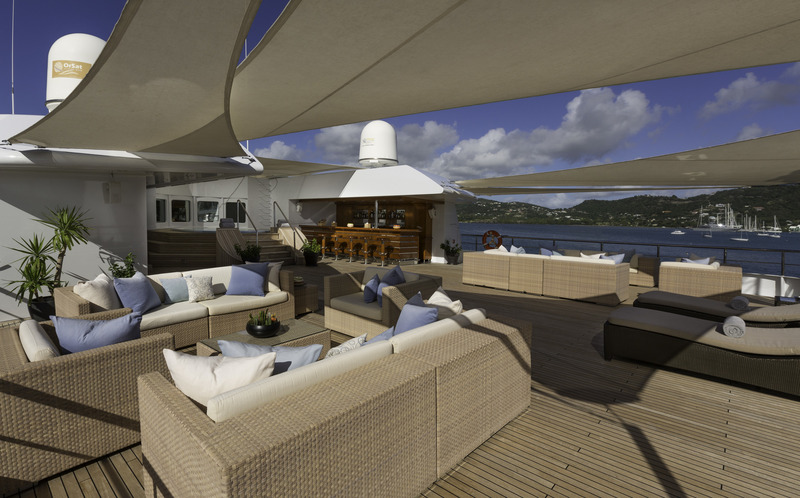 Guests looking for a sheltered outdoor living area will find the upper deck provides two grand alfresco dining tables on the port side and centre, while the starboard side offers a comfortable lounge overlooking the glass balustrades. 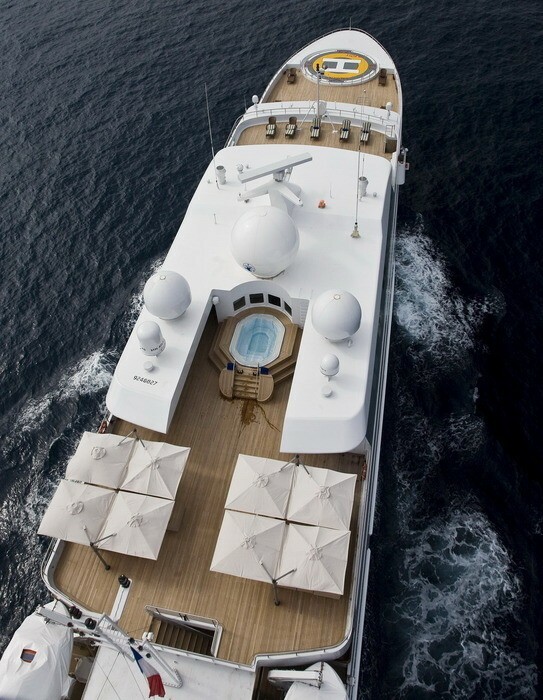 The bridge deck aft stores the tenders and larger motorised water toys, which are easily launched and retrieved with the use of a Davit crane. 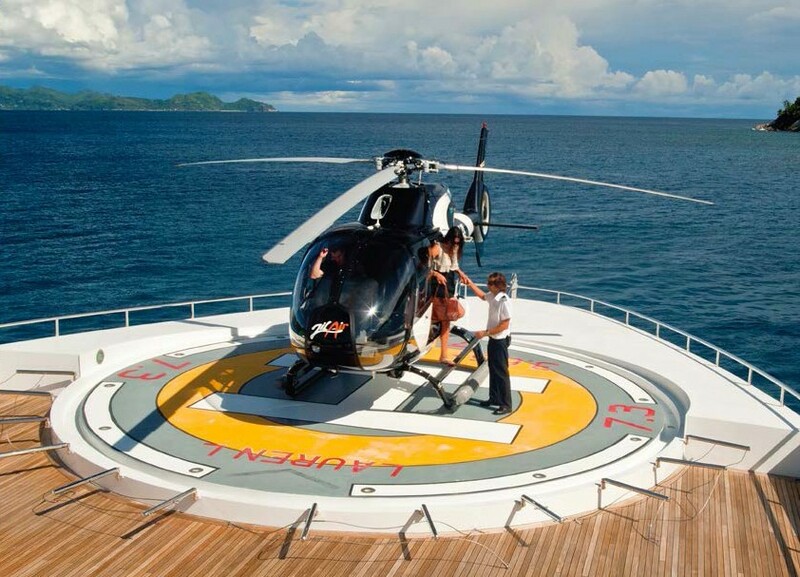 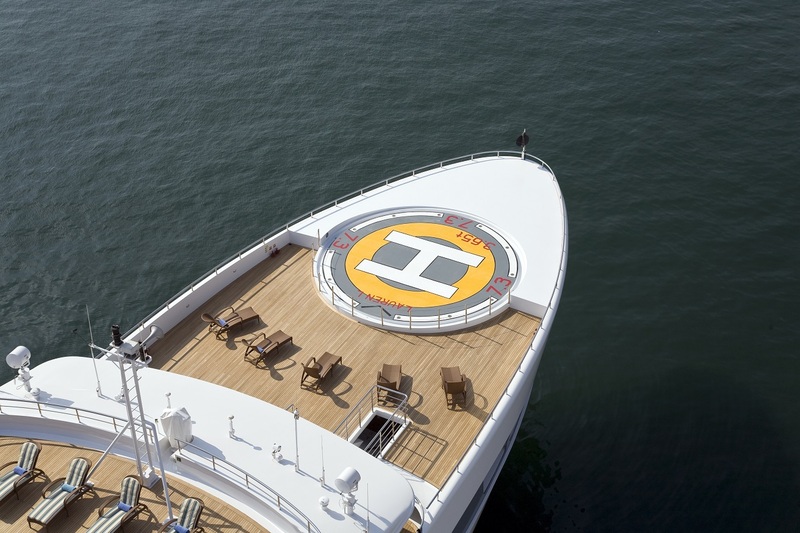 The foredeck is left clear for access to the helipad on the bow, and when not in use the area can be used for observation and hosting events. 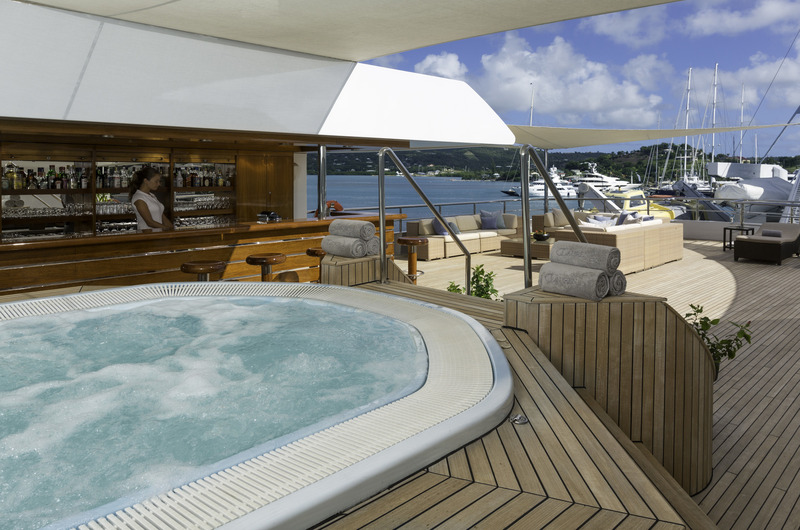 On the sundeck, the aft section contains plenty of plush sundeck seating for a large alfresco meal, and there is also a massive Jacuzzi where guests can soak together while enjoying a cocktail from the nearby wet bar. 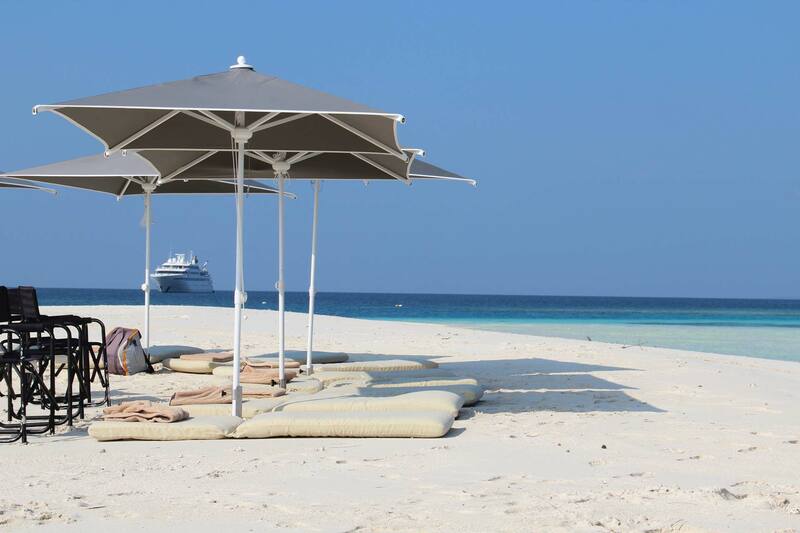 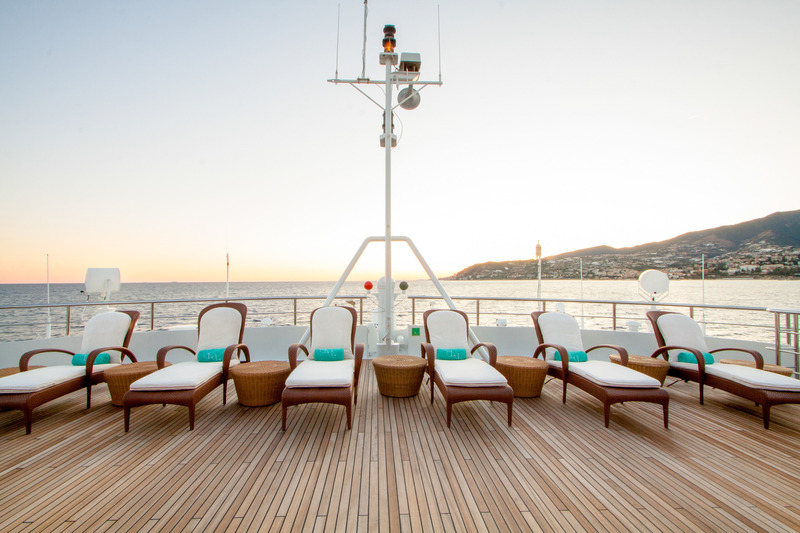 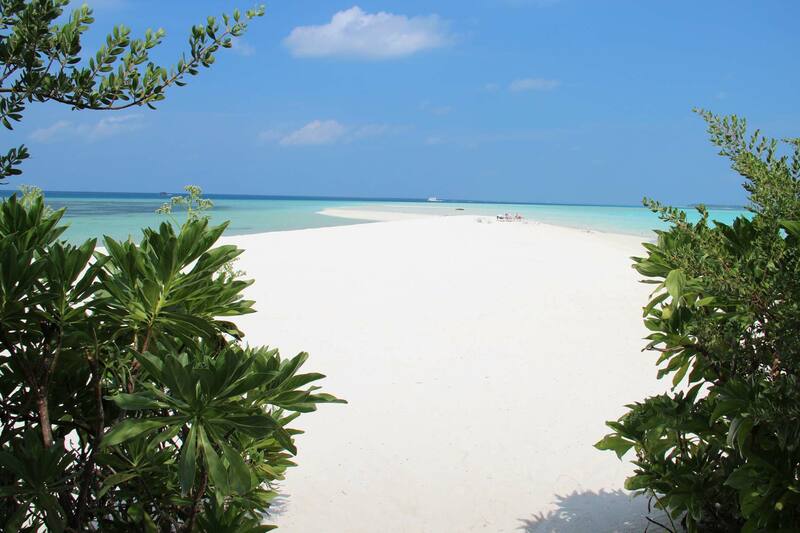 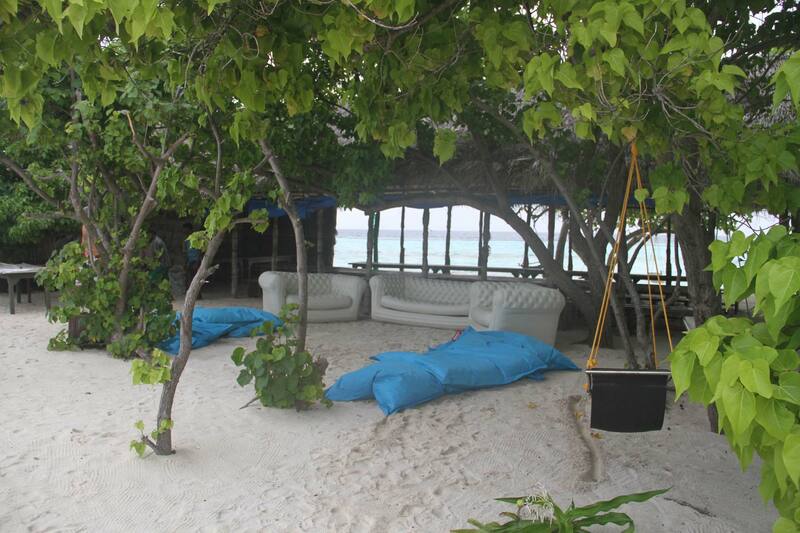 The sundeck forward is fitted with numerous sun loungers for guests to unwind together and take in the forward views. 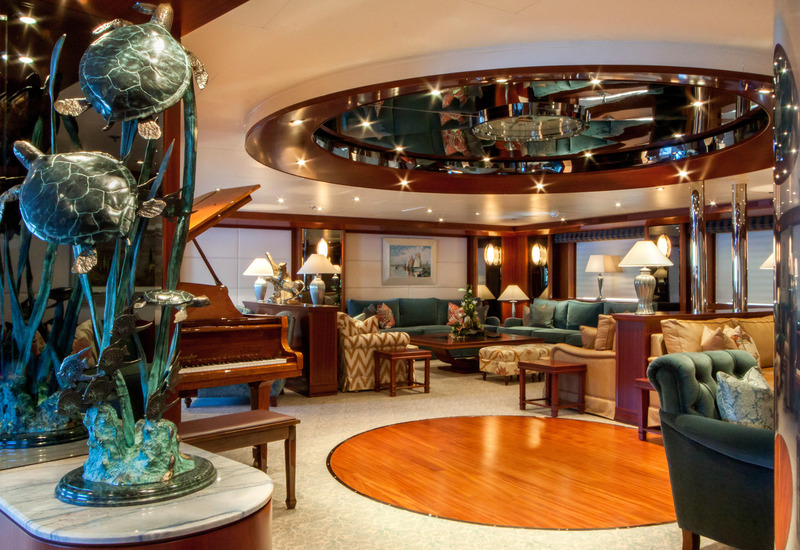 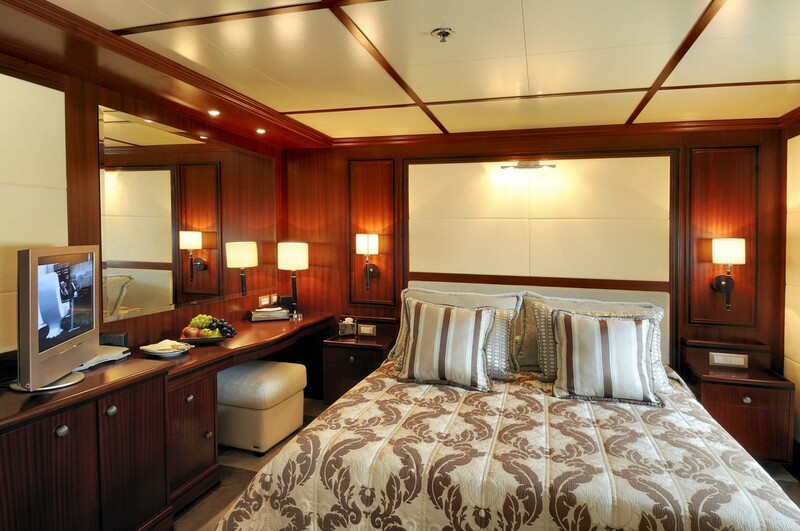 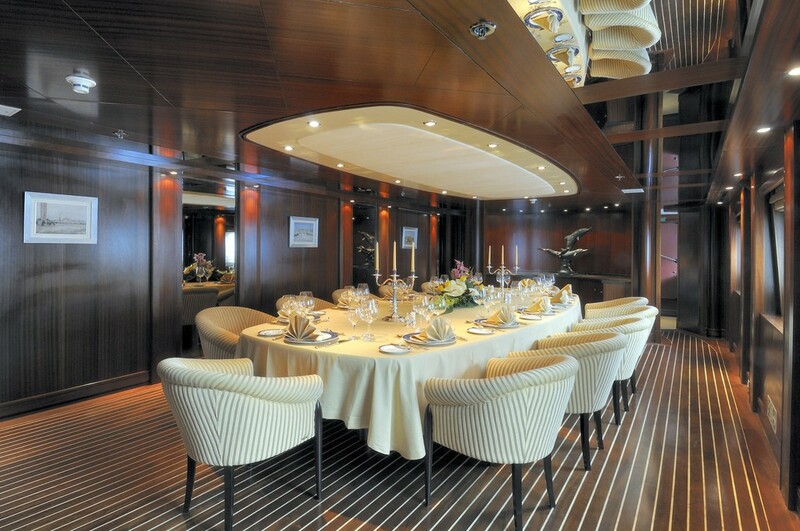 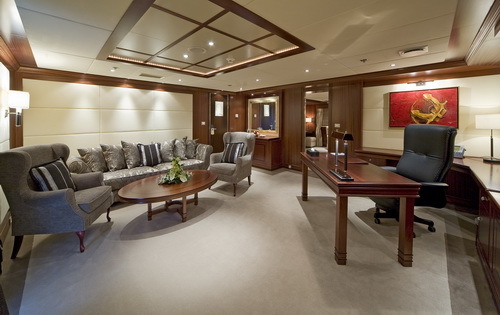 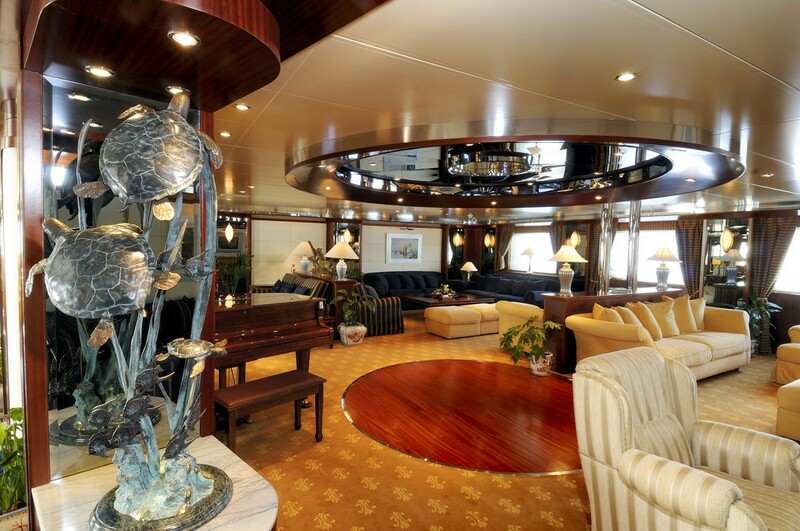 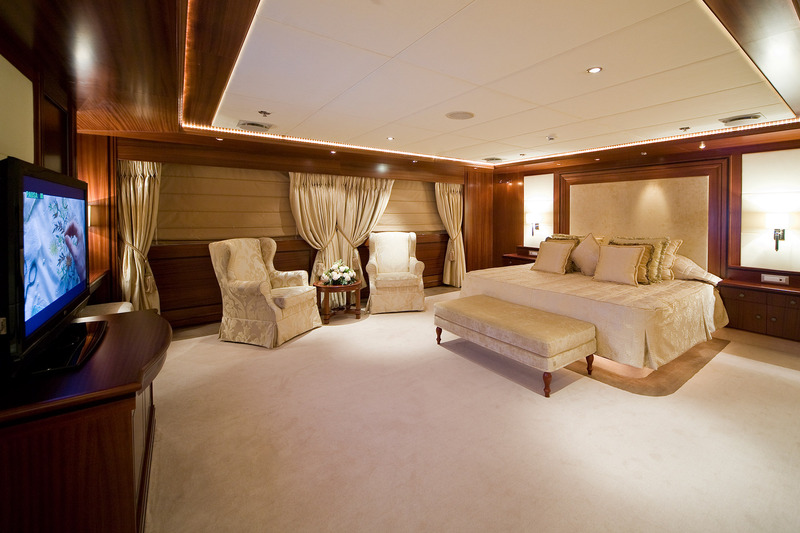 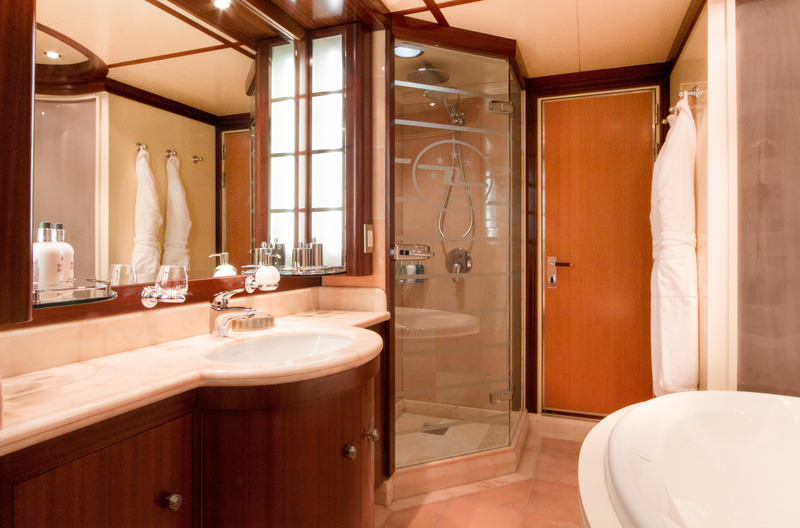 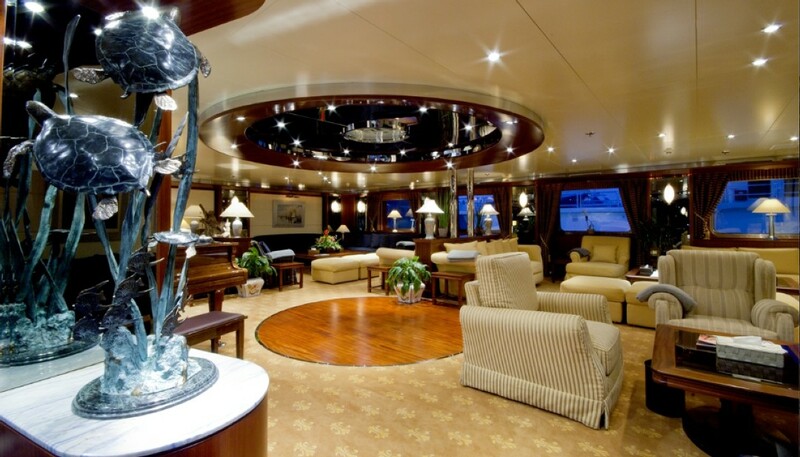 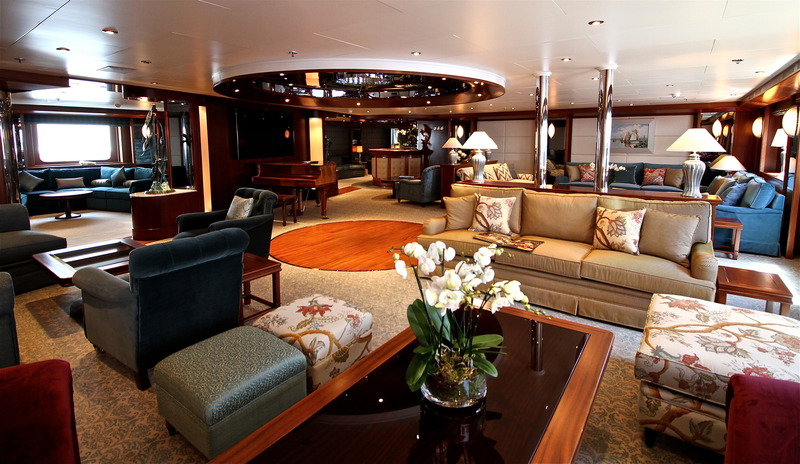 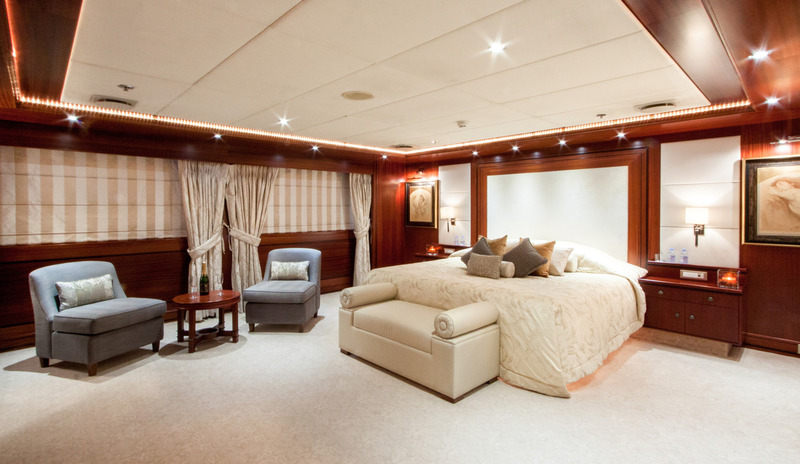 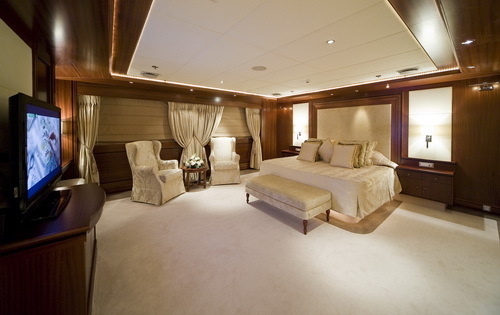 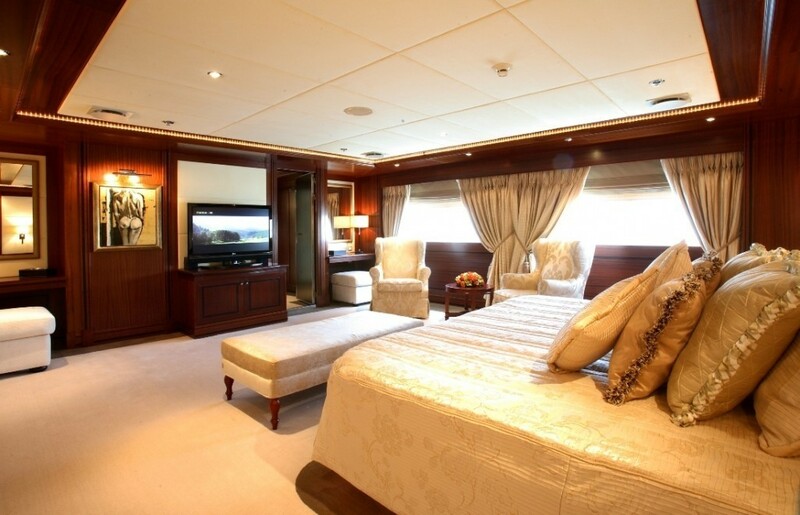 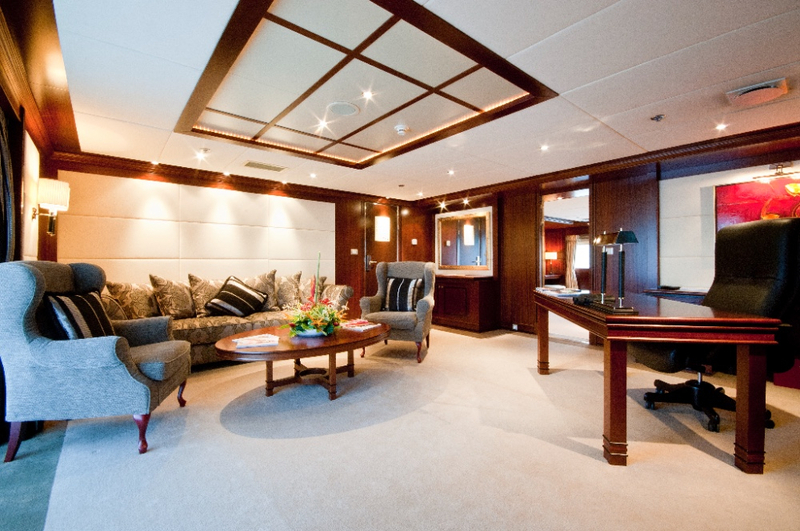 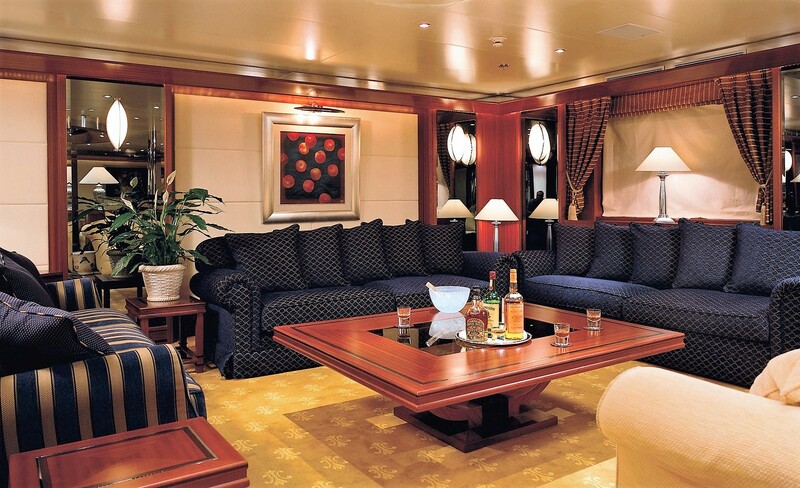 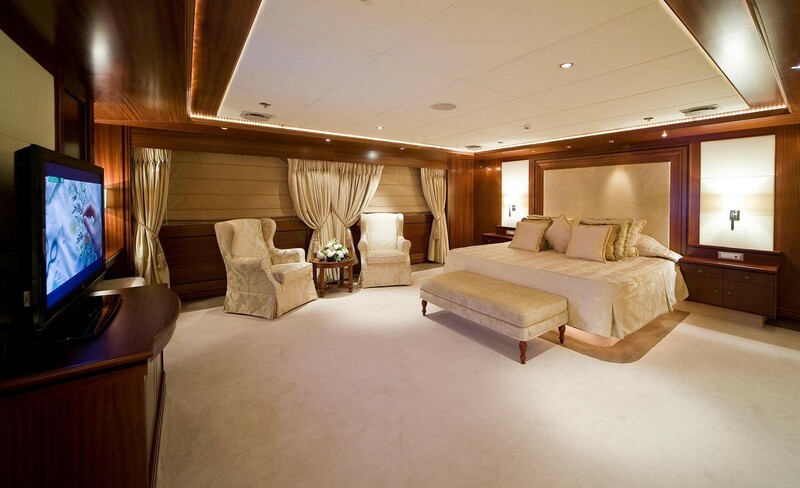 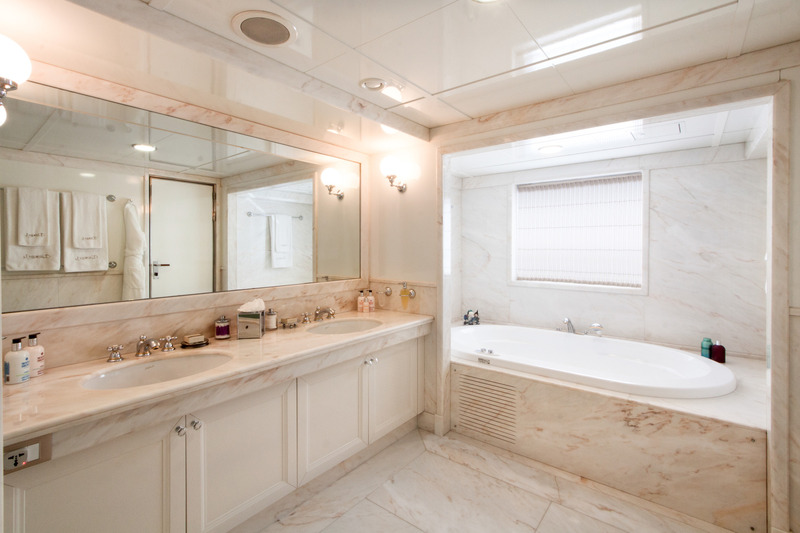 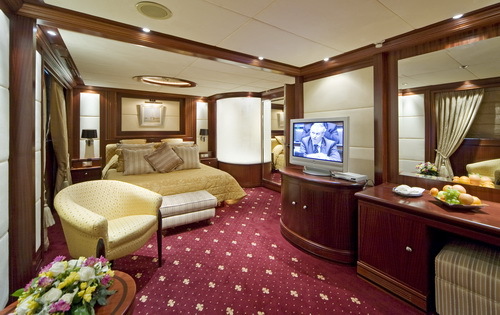 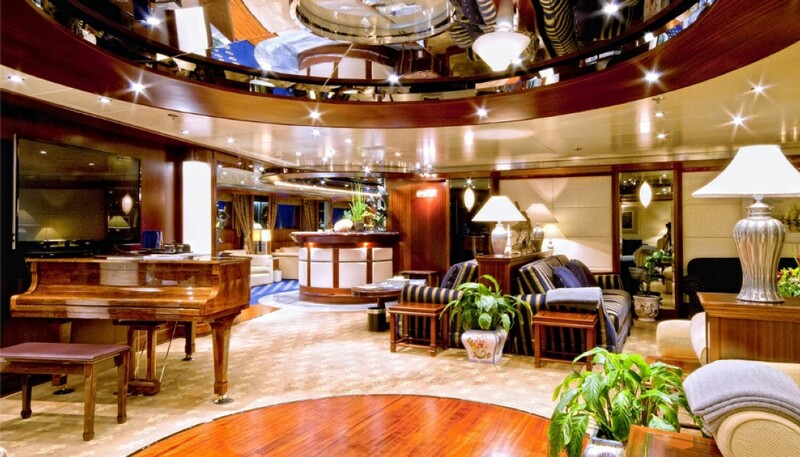 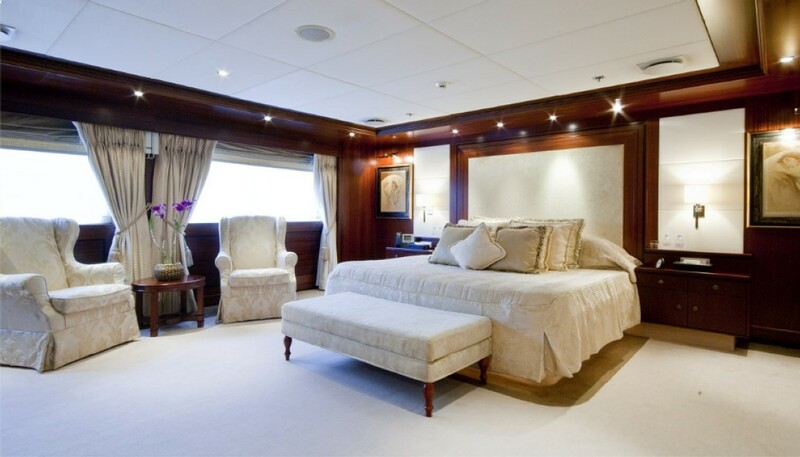 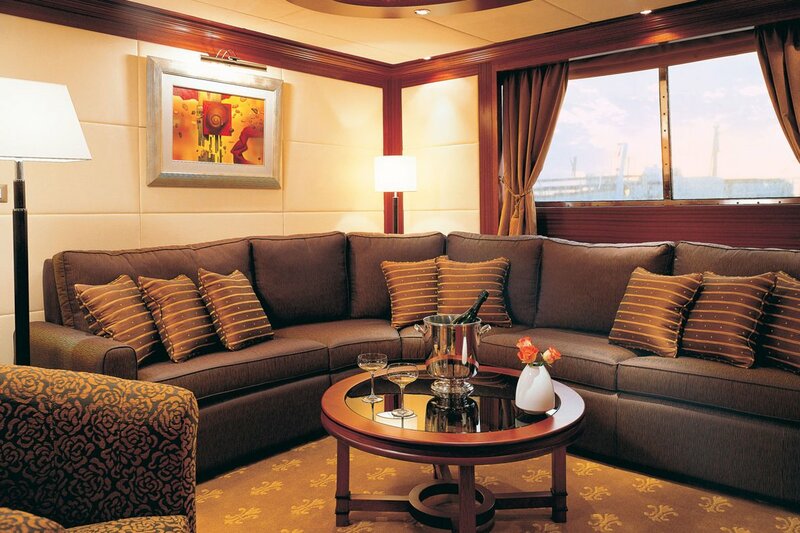 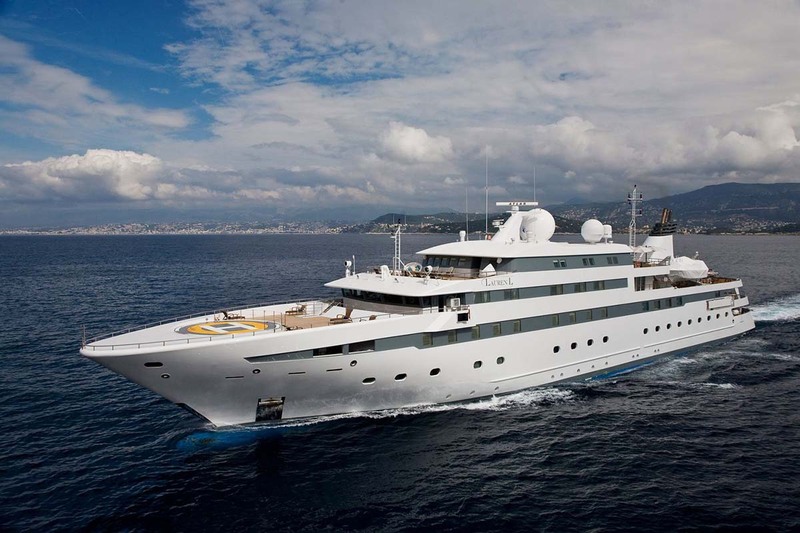 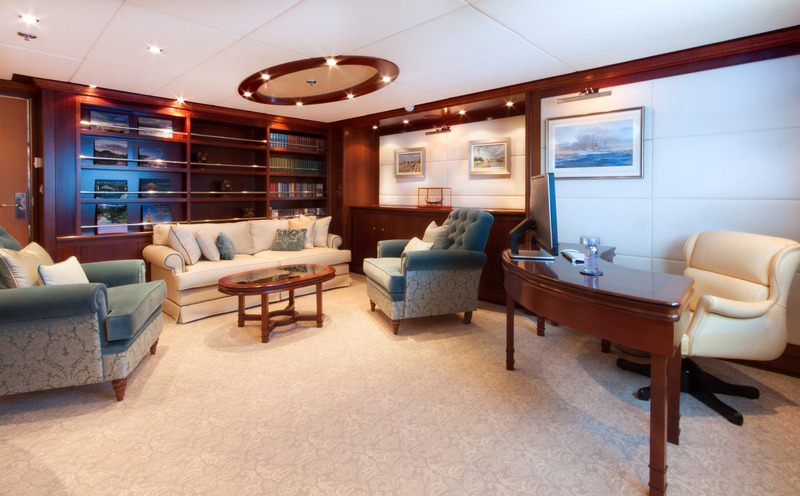 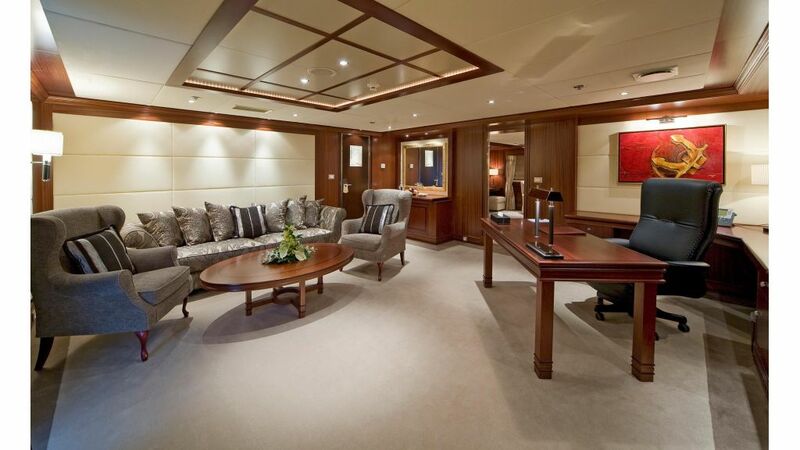 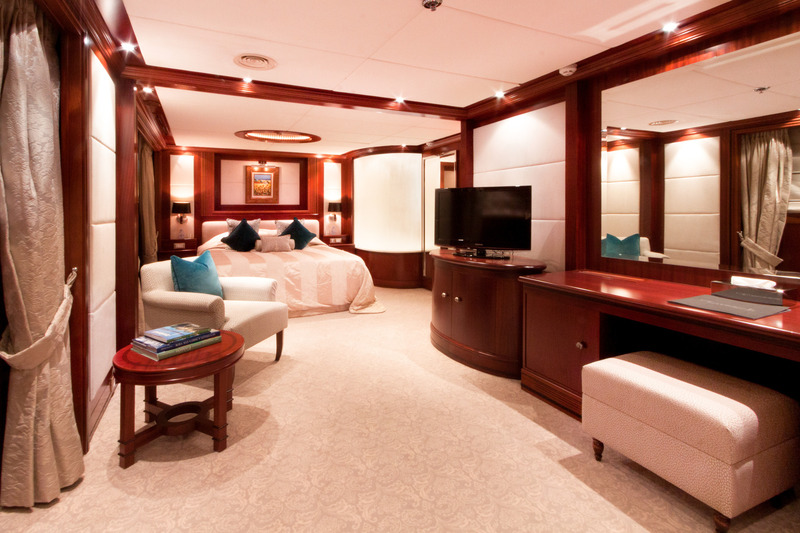 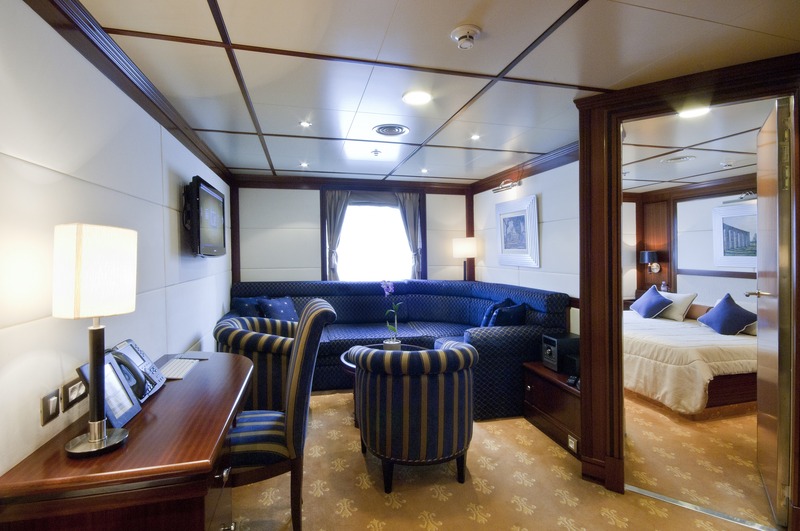 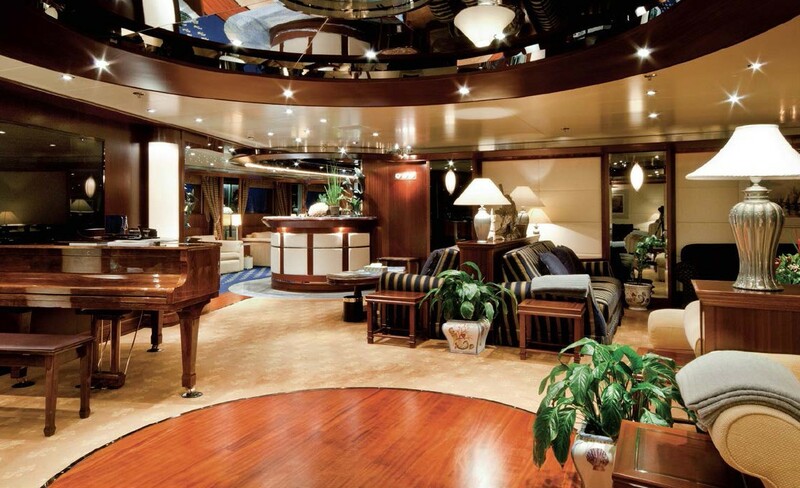 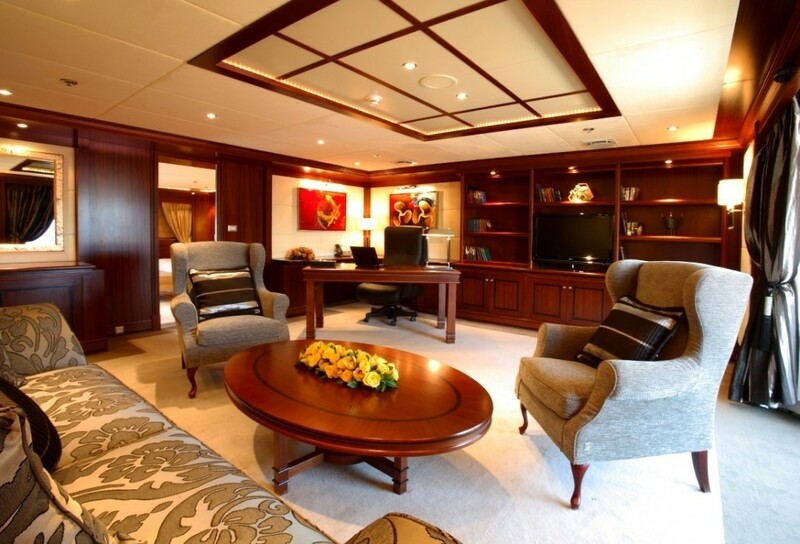 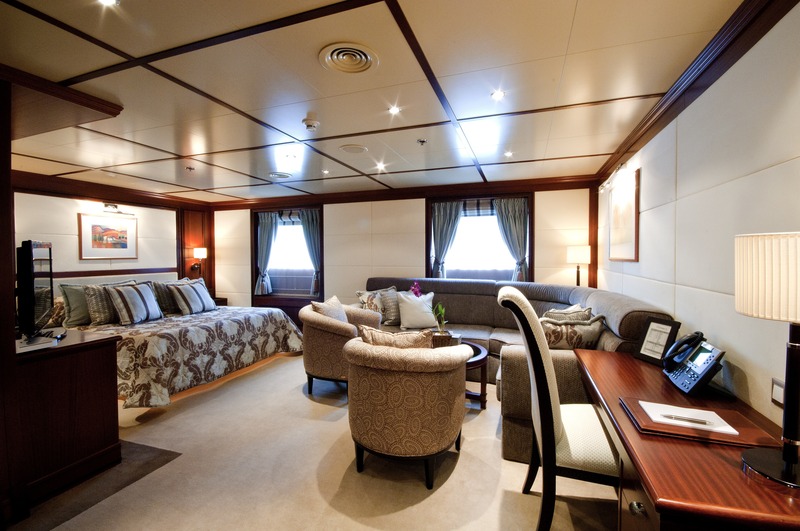 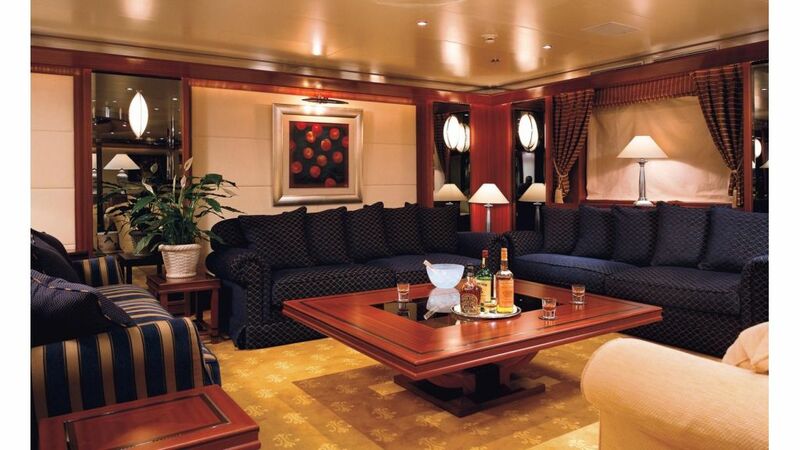 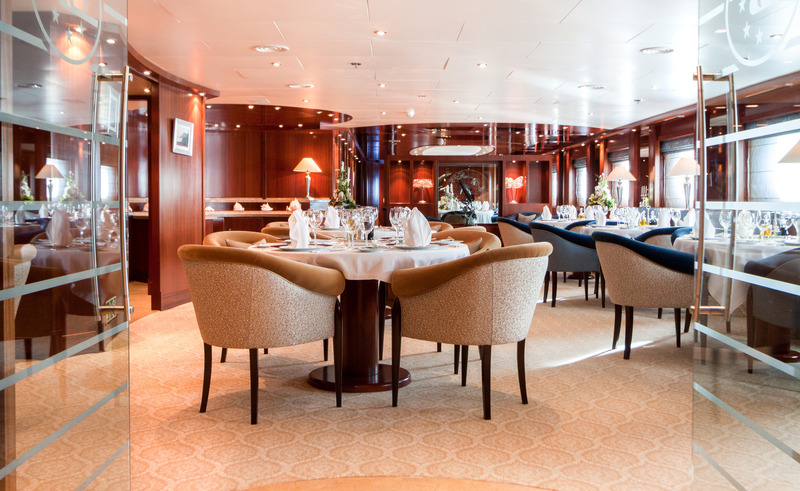 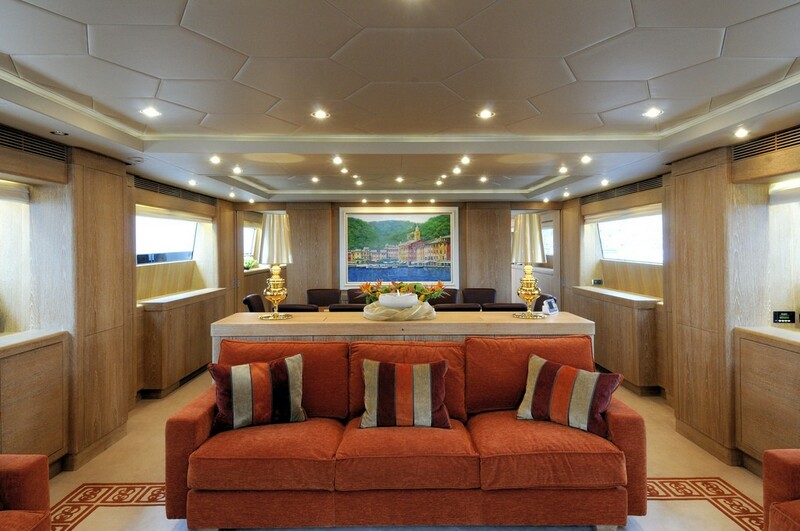 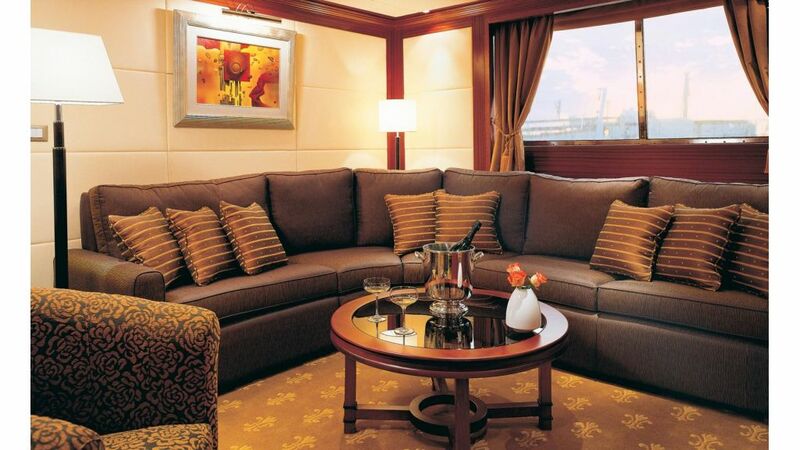 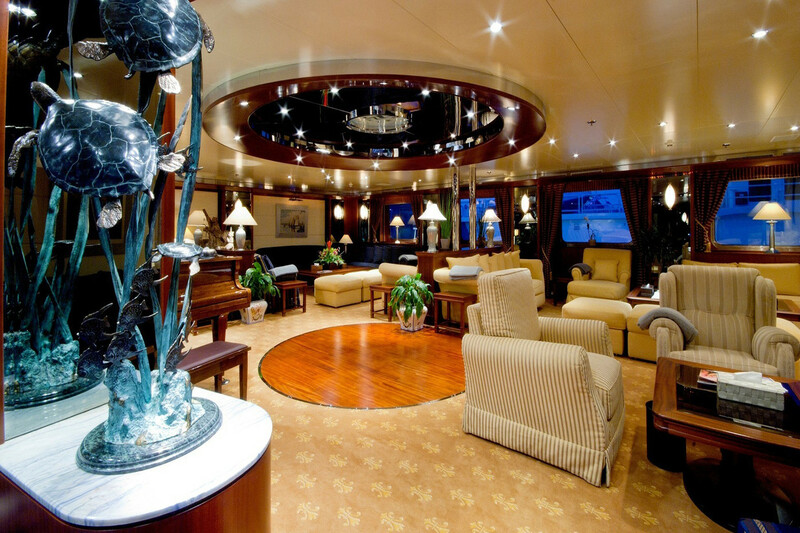 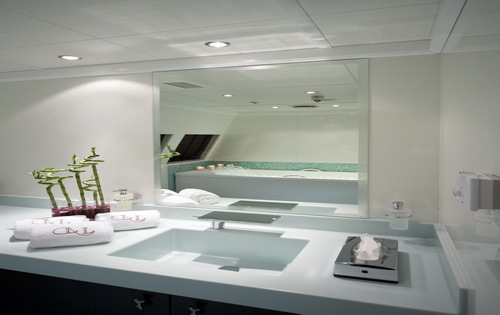 The main deck forward contains five large en-suite cabins each with their own lounge. 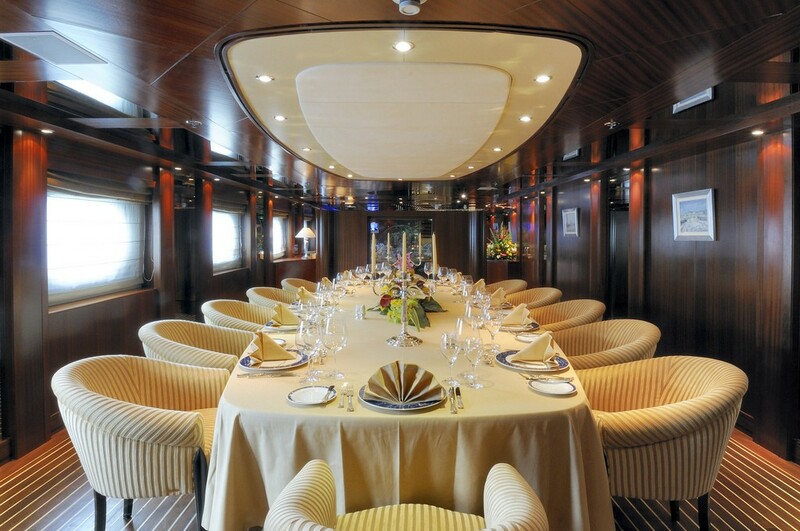 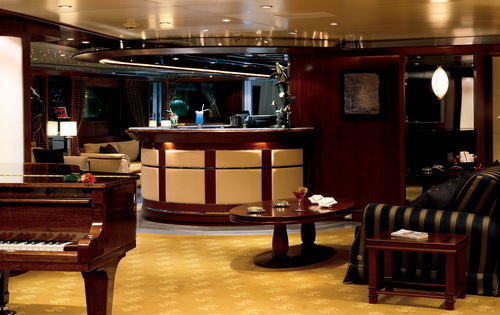 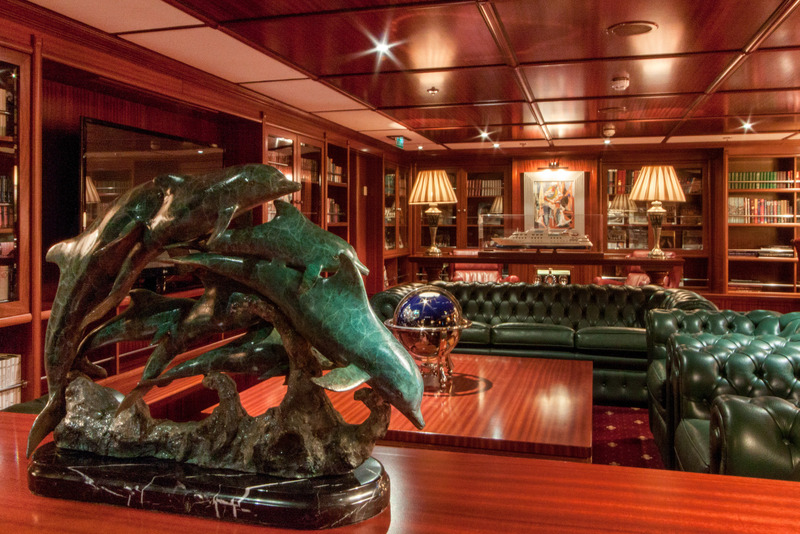 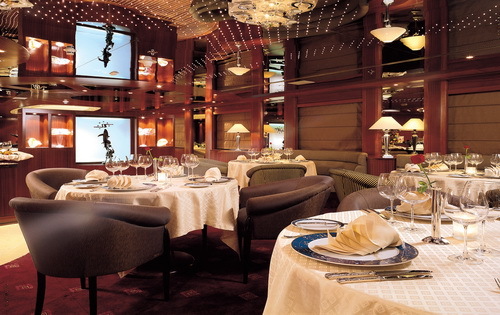 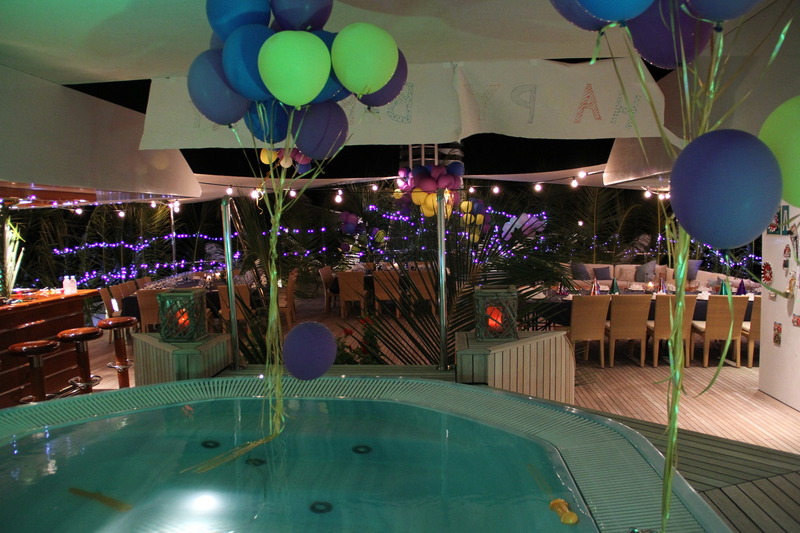 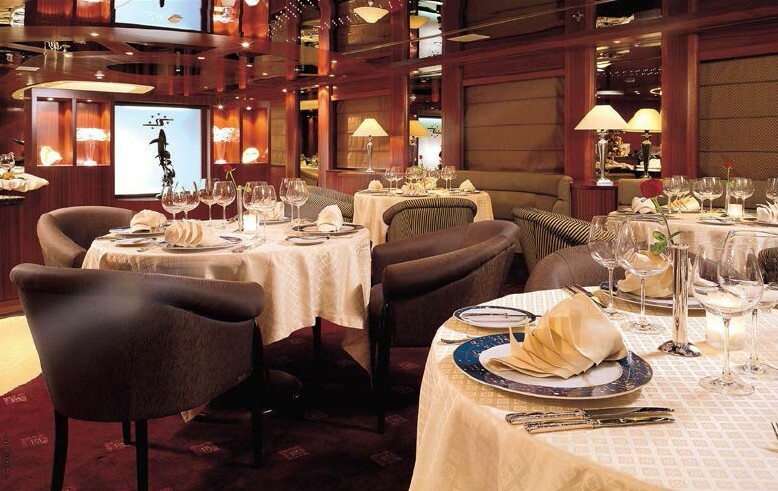 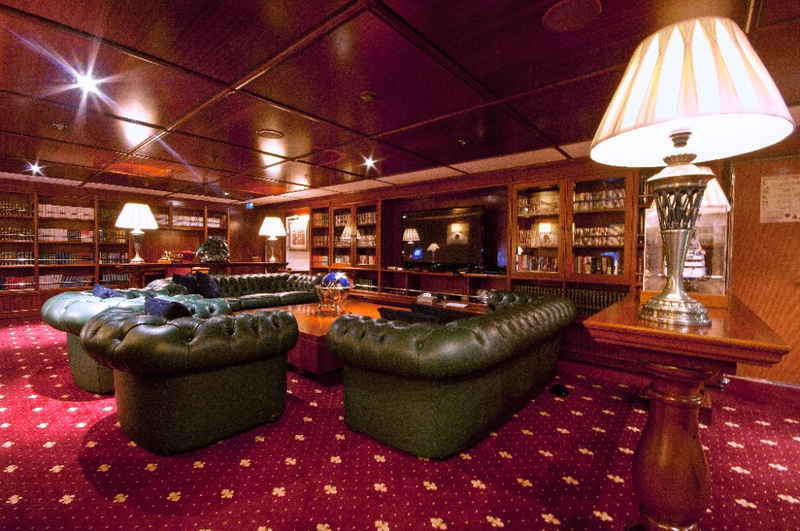 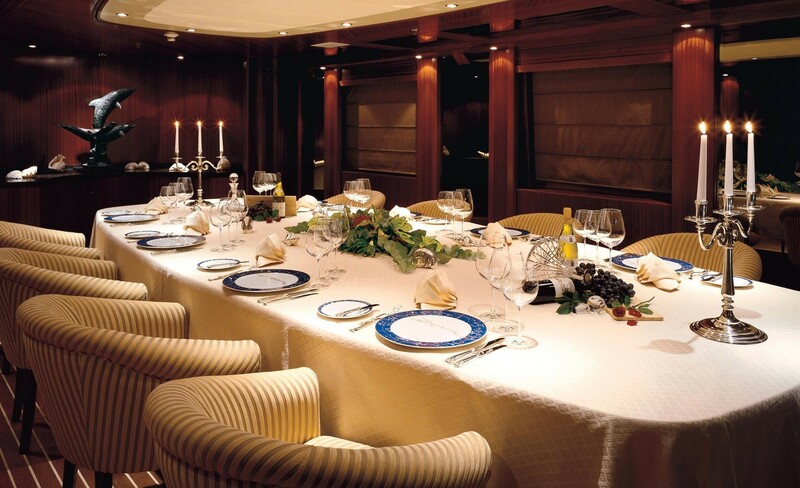 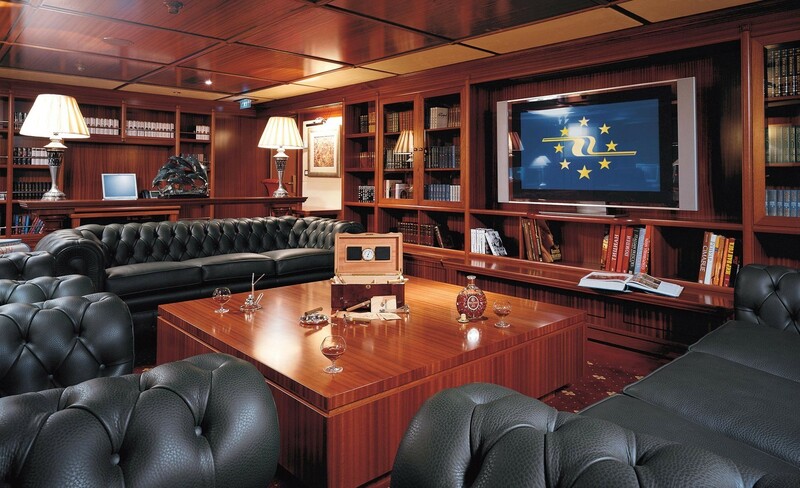 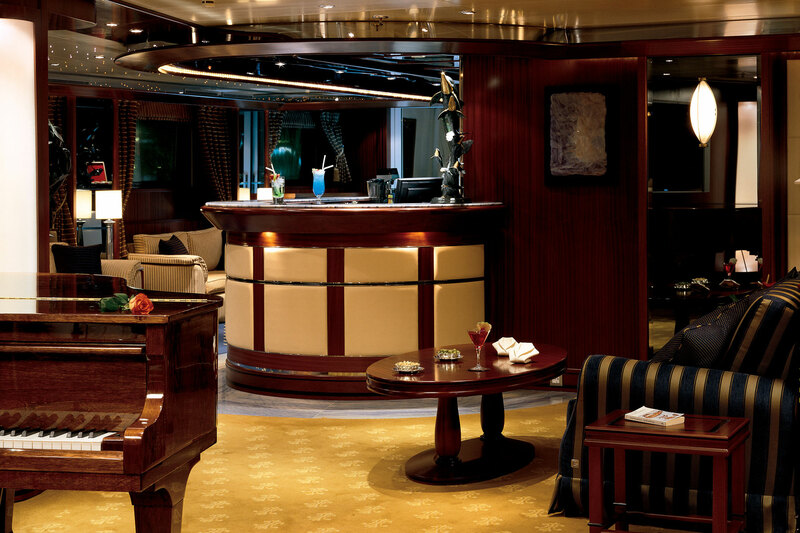 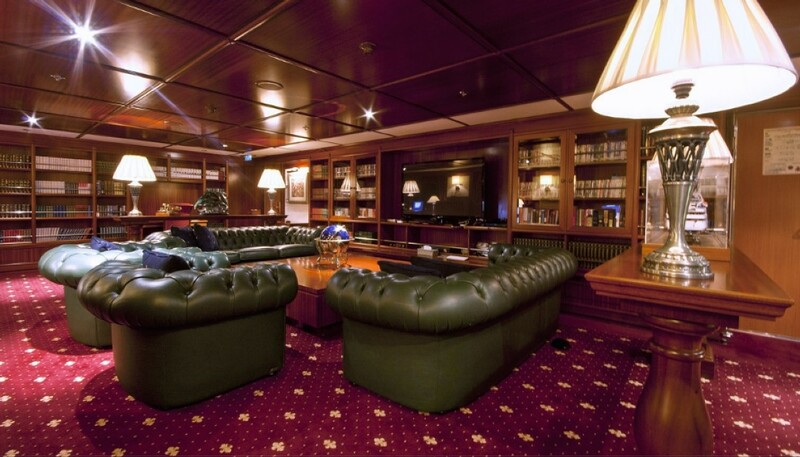 Amidships, there is an atmospheric lounge styled with dark wooden panelling and contemporary furnishings after a meal in either the formal dining room to seat up to 16 guests, or the larger dining and entertaining area, where there is a grand piano for live music while guests dine at smaller circular tables for more intimate conversations. 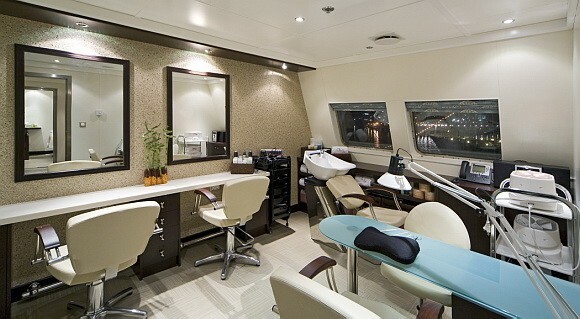 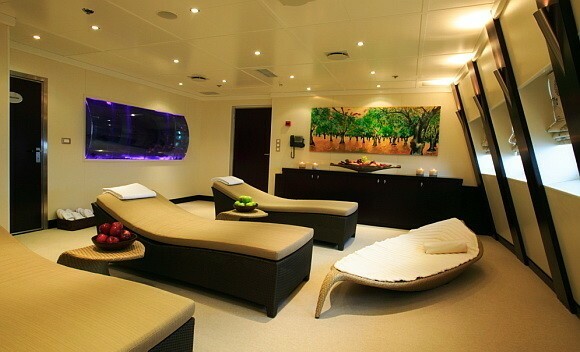 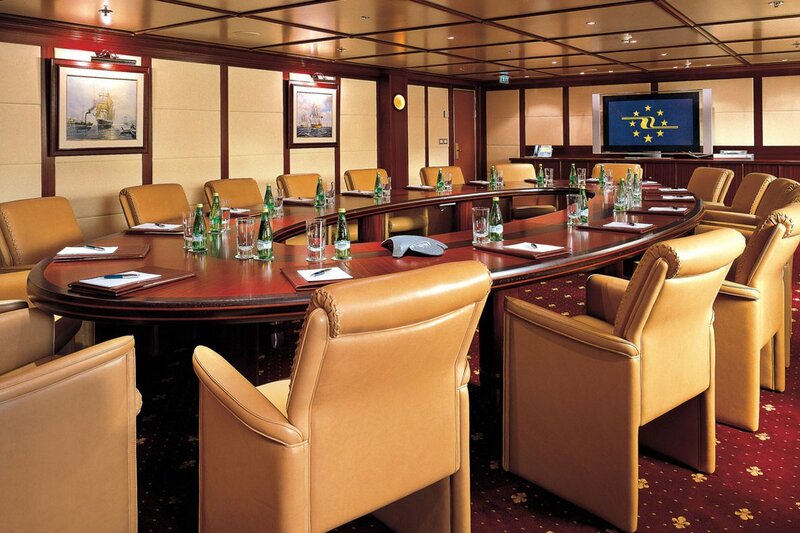 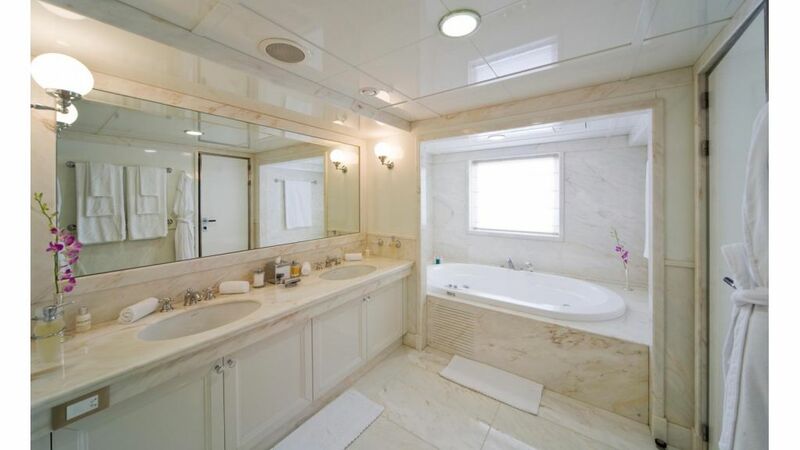 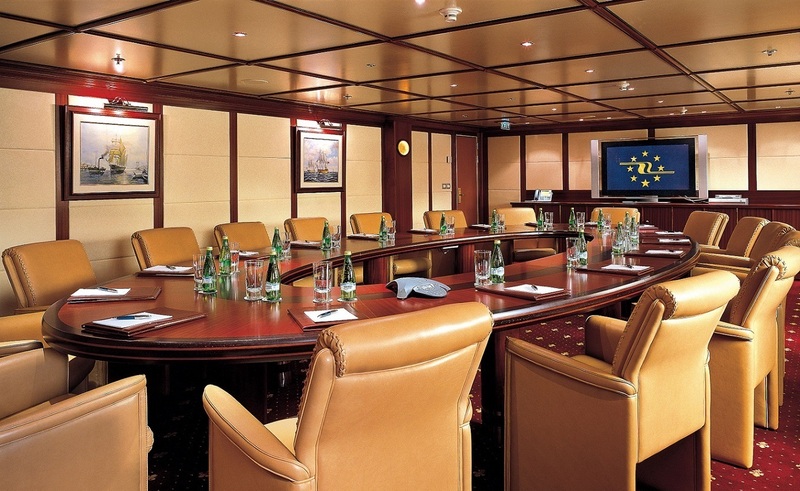 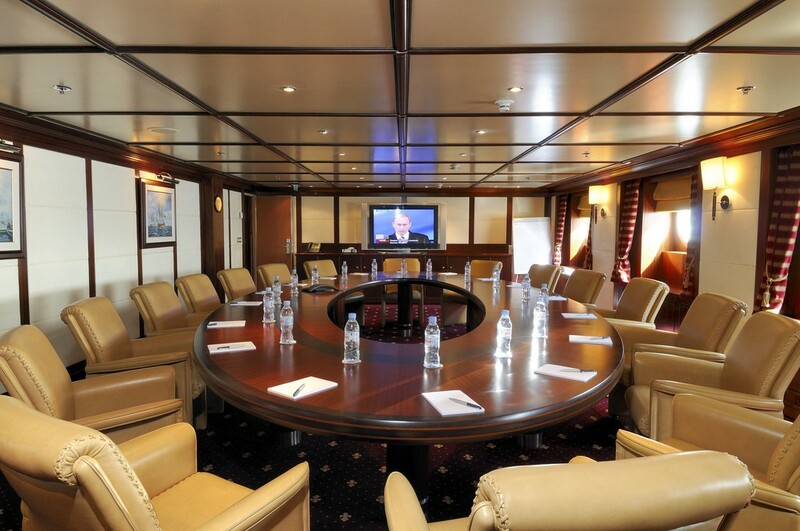 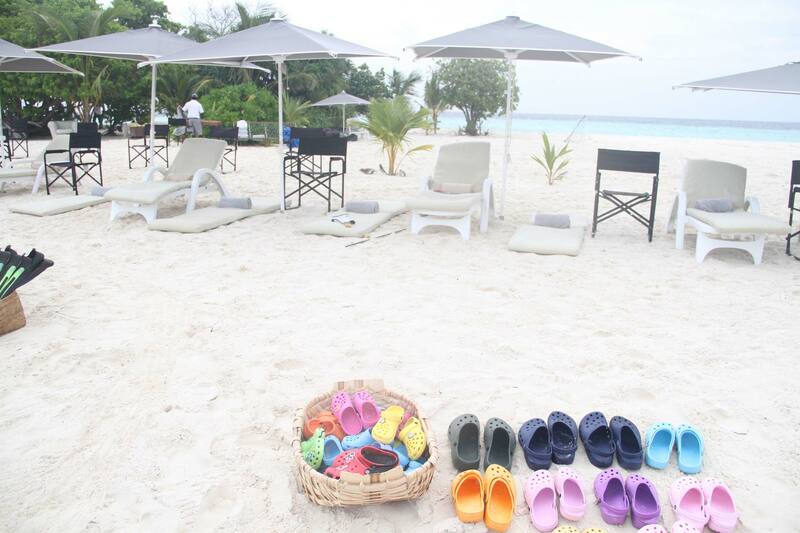 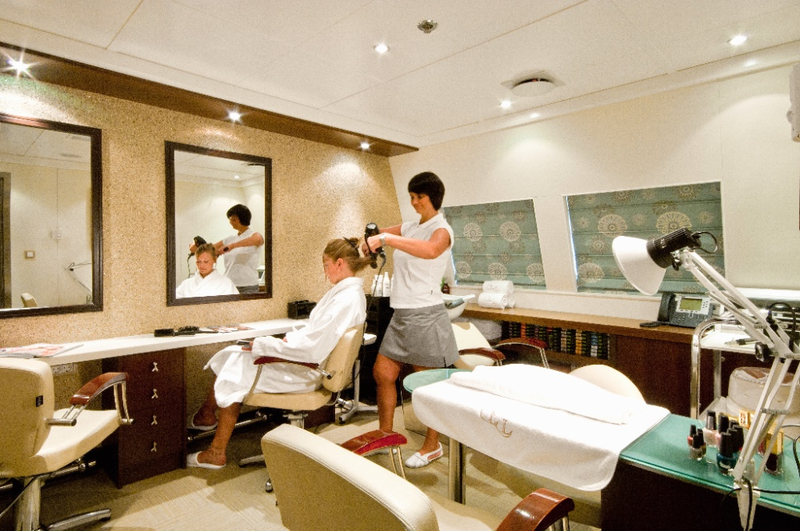 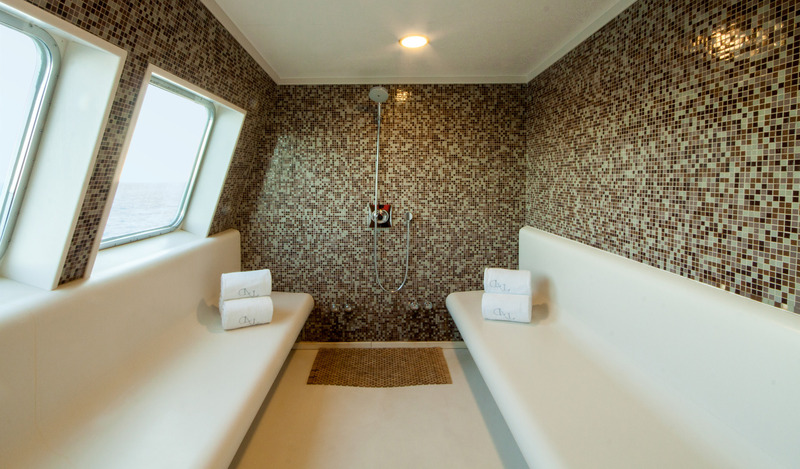 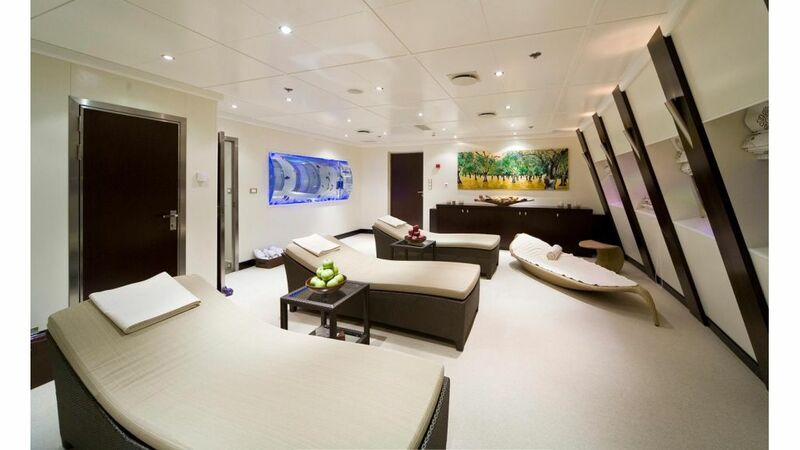 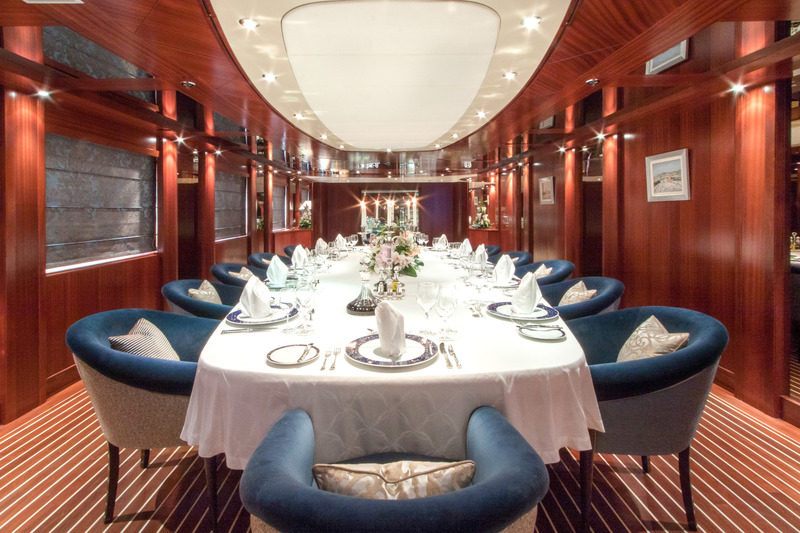 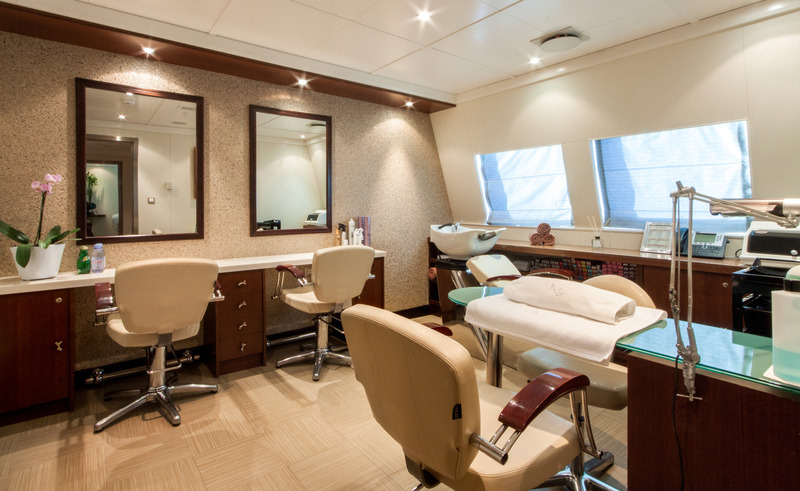 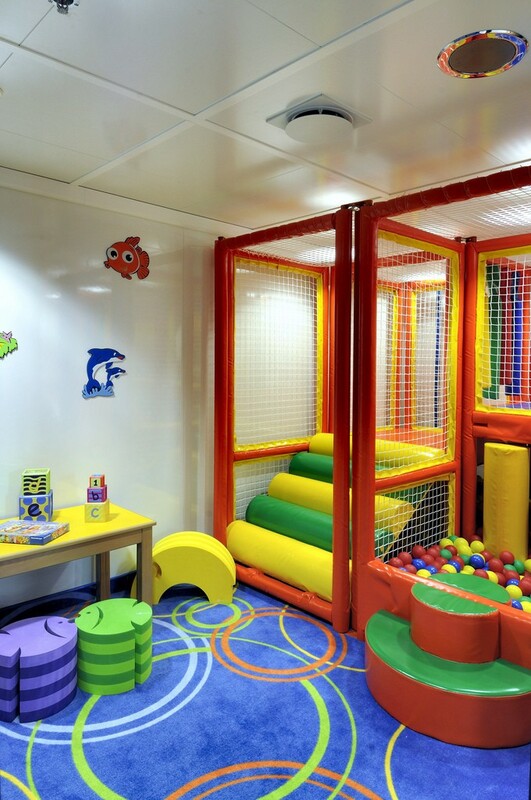 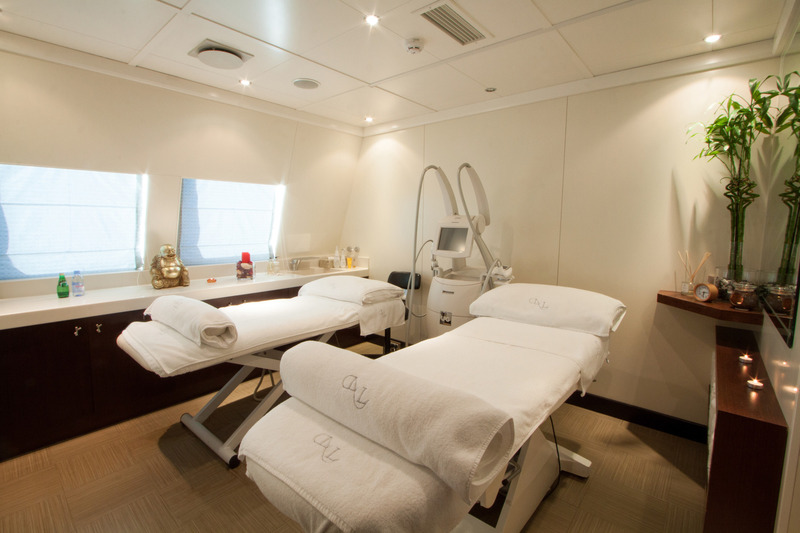 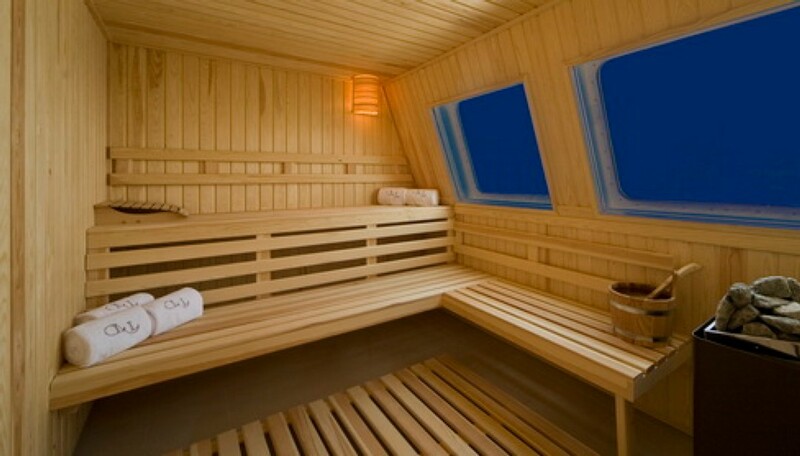 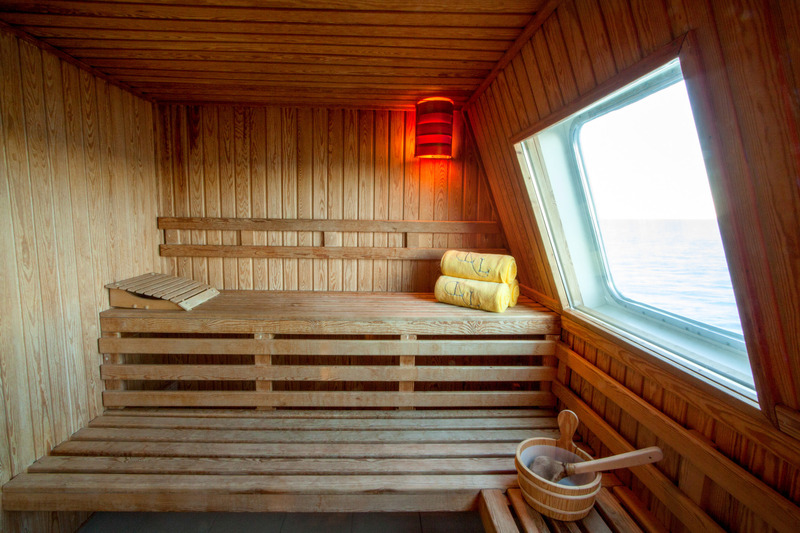 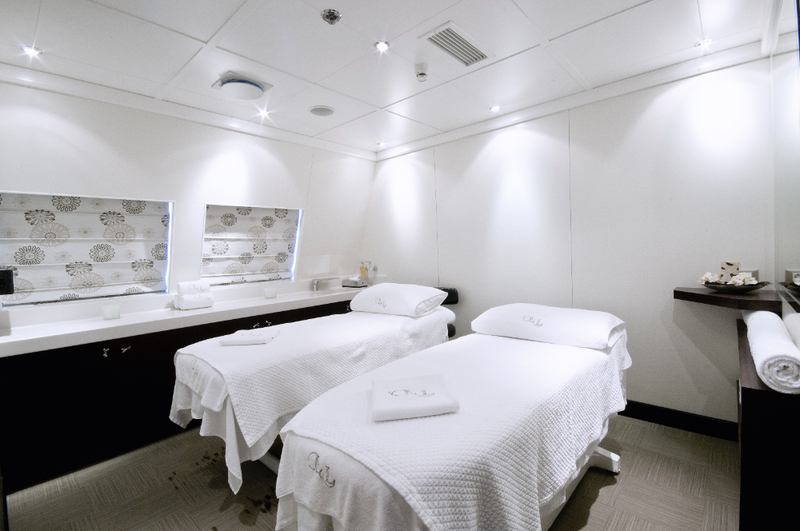 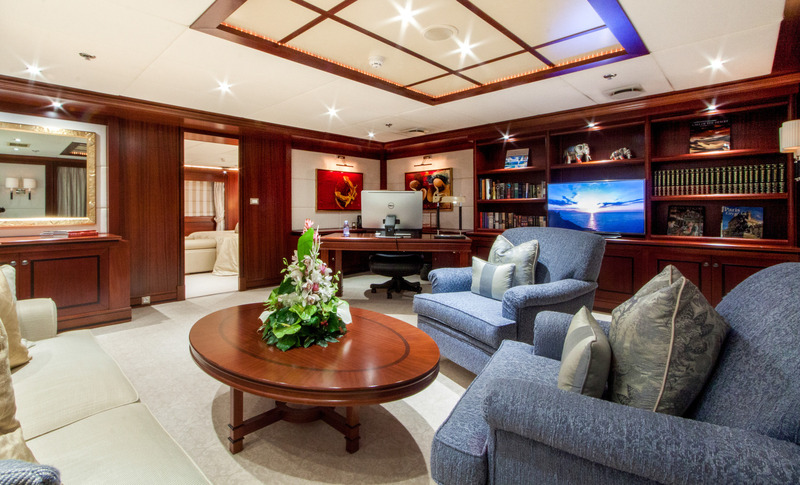 To the aft of the main deck, there is a sizeable conference room and other facilities including a massage room, steam room, sauna and aromatherapy room as well as a children's playroom. 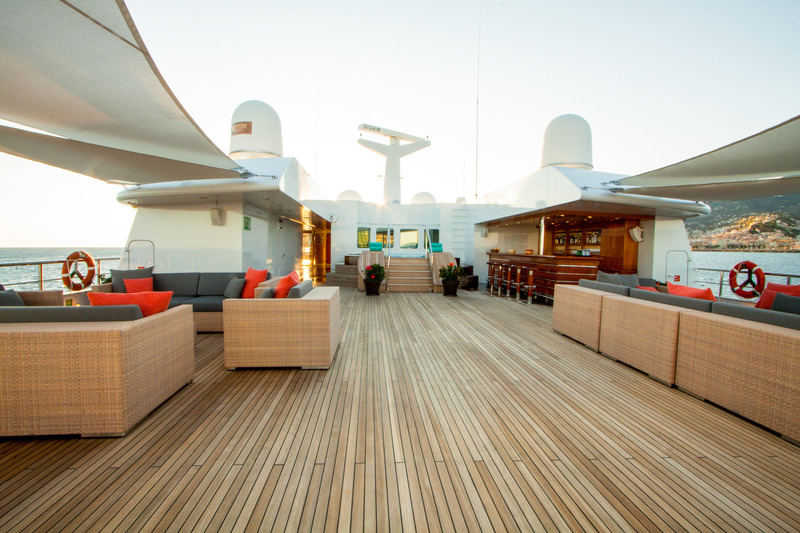 On the upper deck the forward and mid sections host 10 more double en-suite cabins, while the aft is dedicated to a large skylounge filled with an abundance of seating that is arranged for groups to break off and enjoy private conversation. 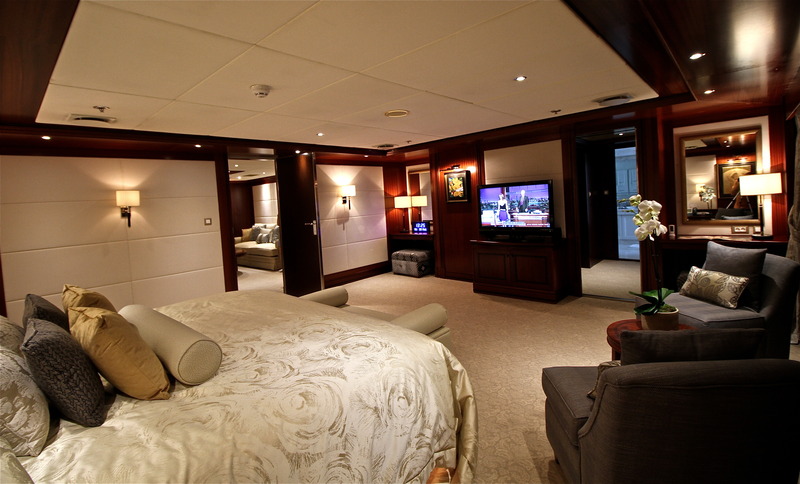 The remainder of the guest cabins are located on the bridge deck, with the Master suite located to the aft and fitted with a private lounge, walk-in wardrobe and en-suite bathroom. 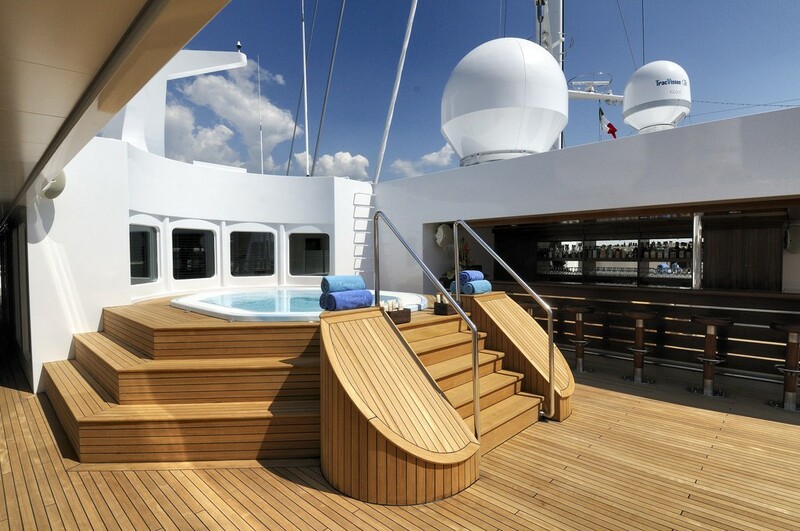 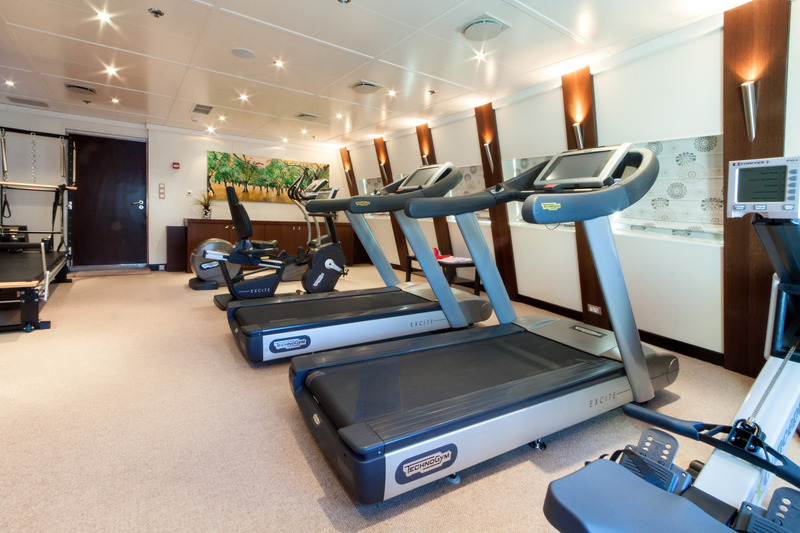 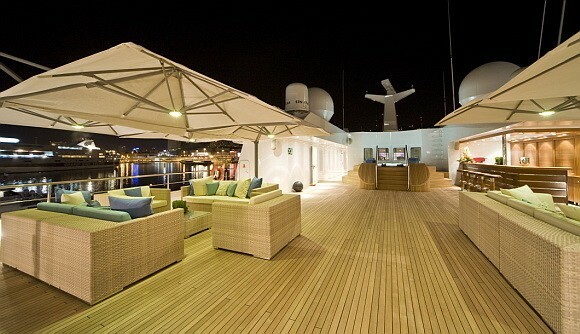 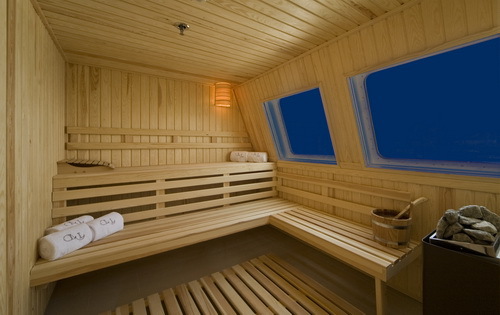 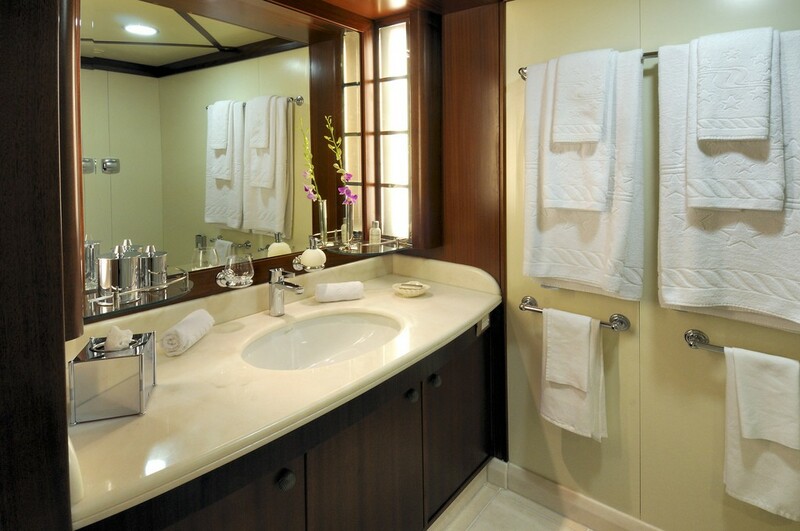 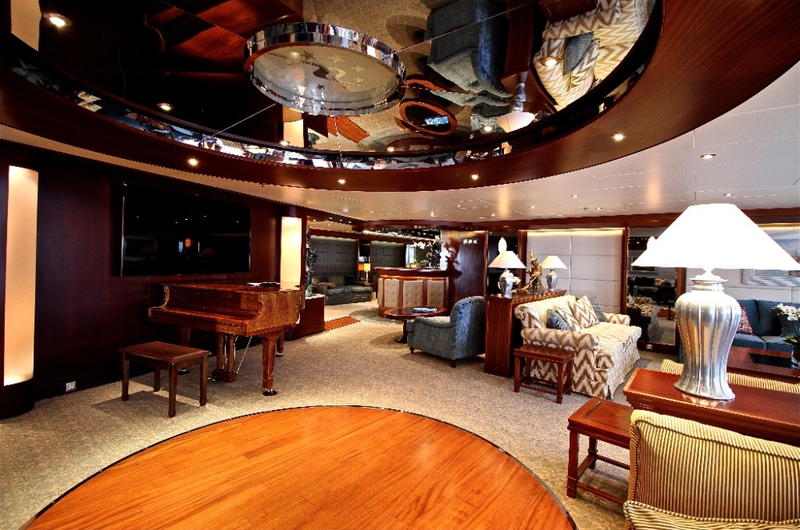 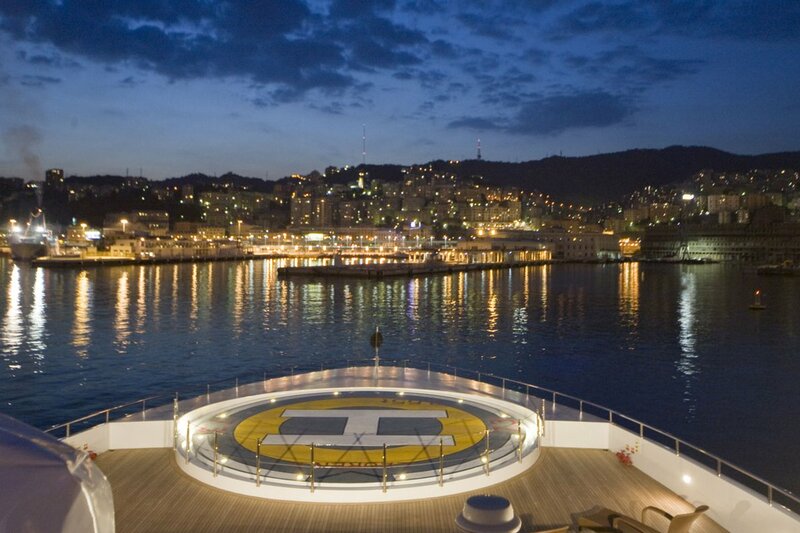 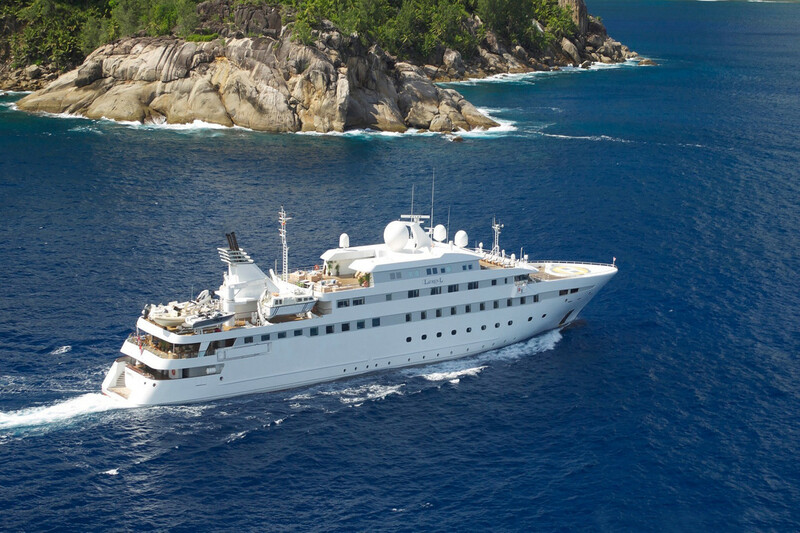 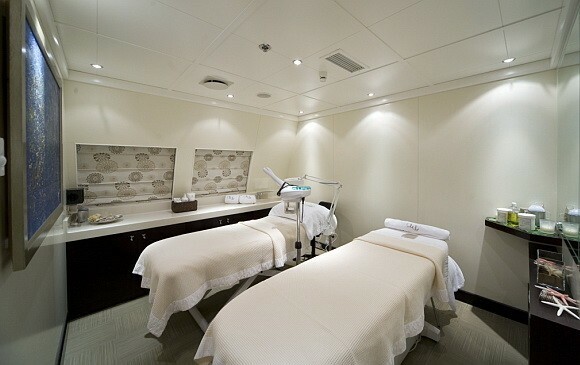 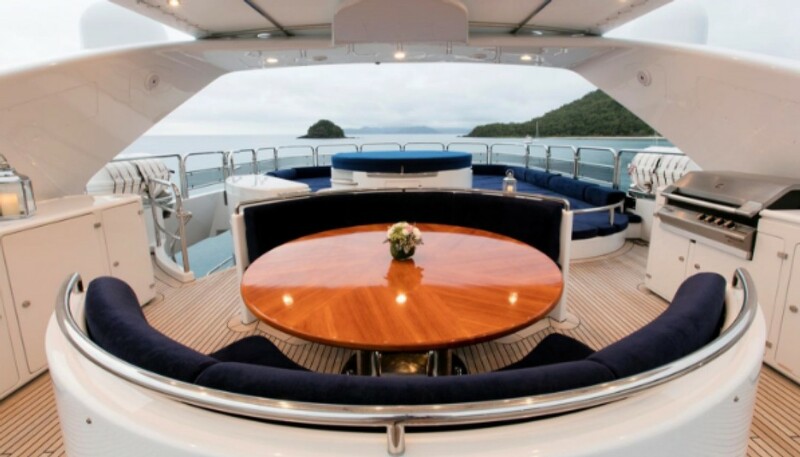 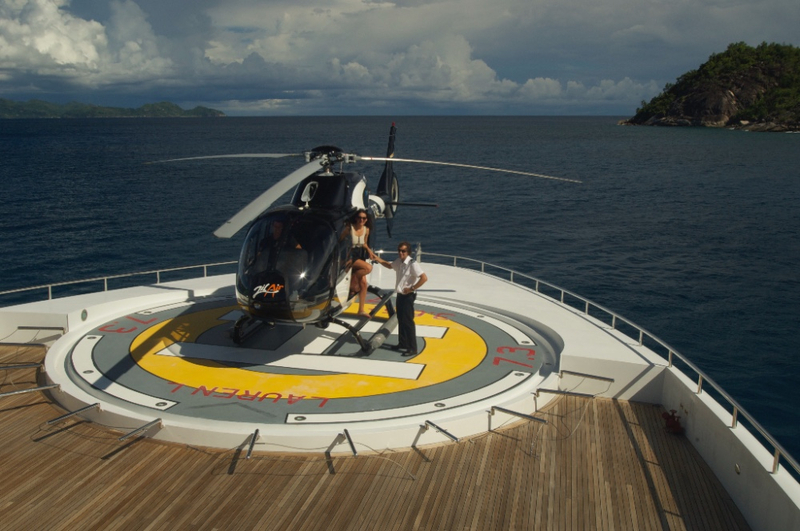 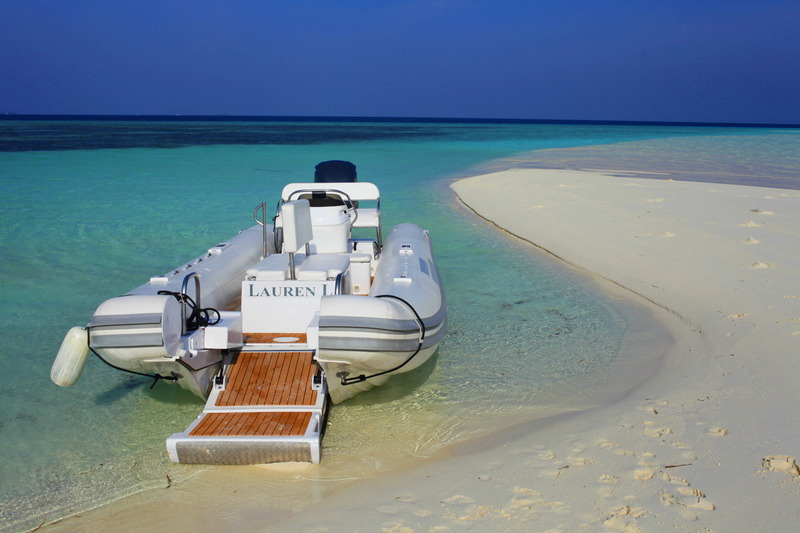 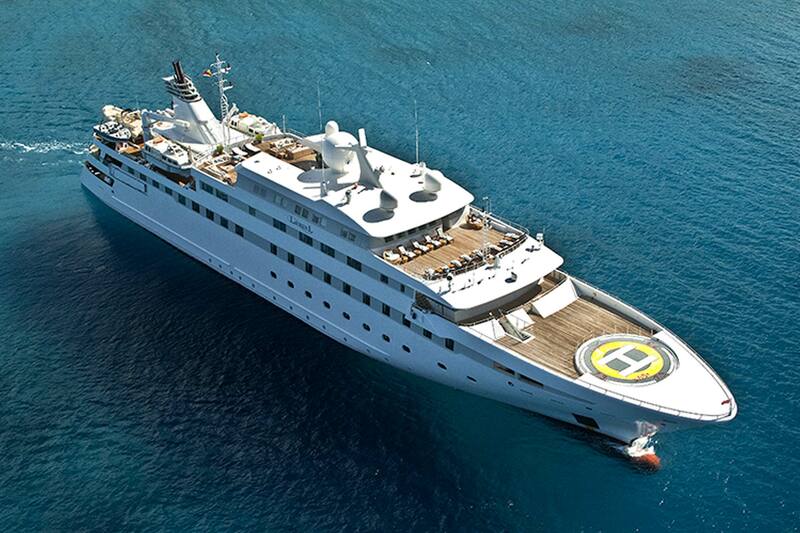 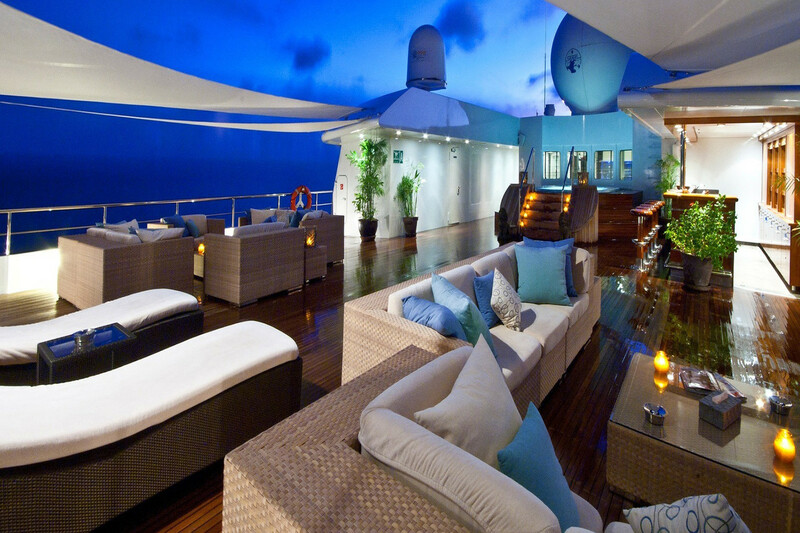 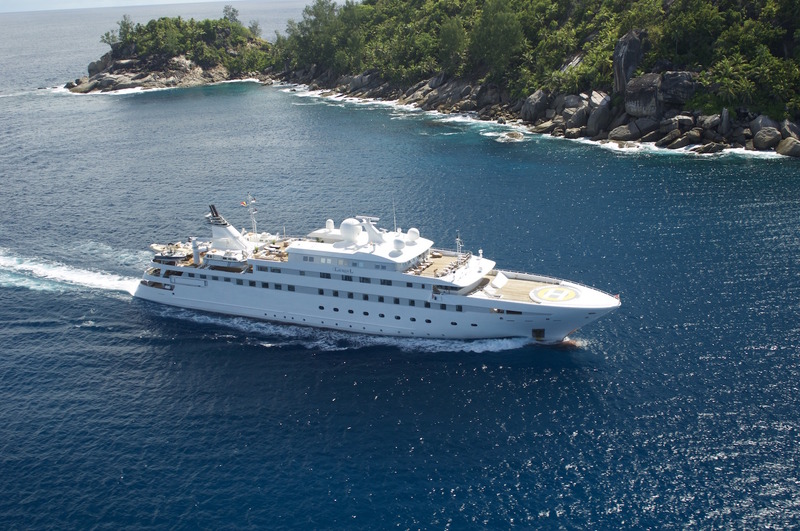 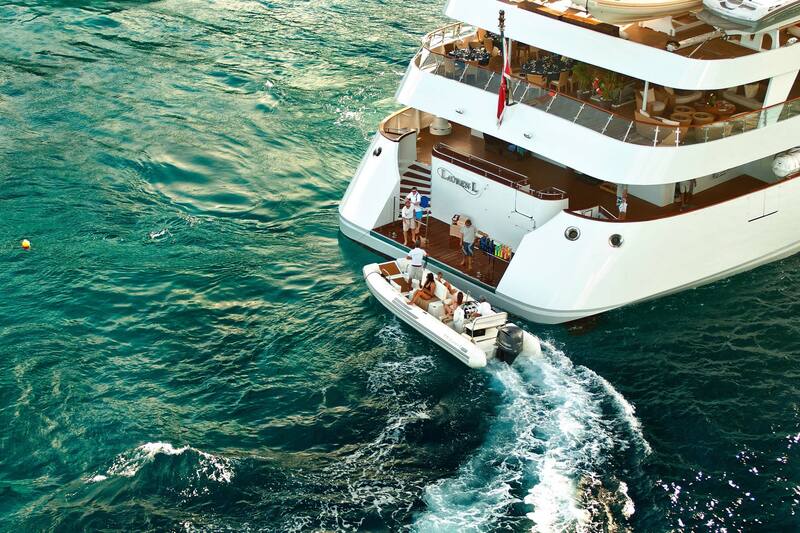 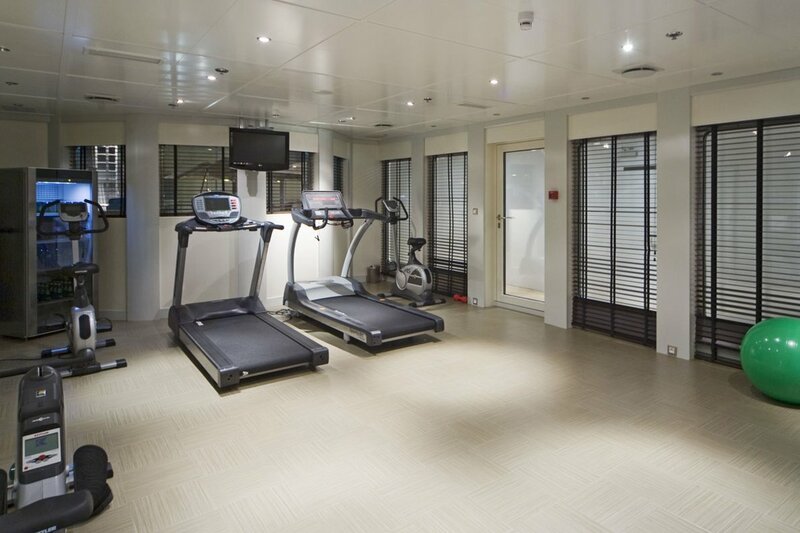 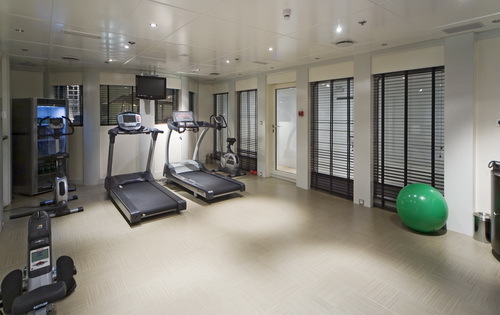 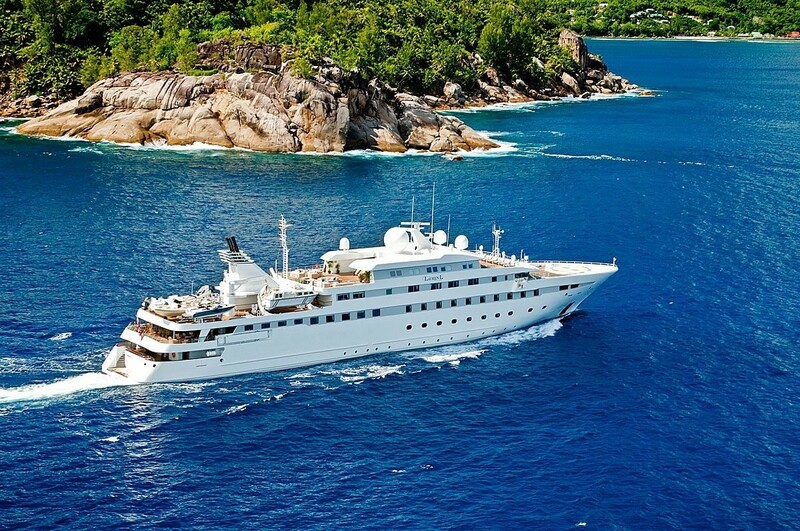 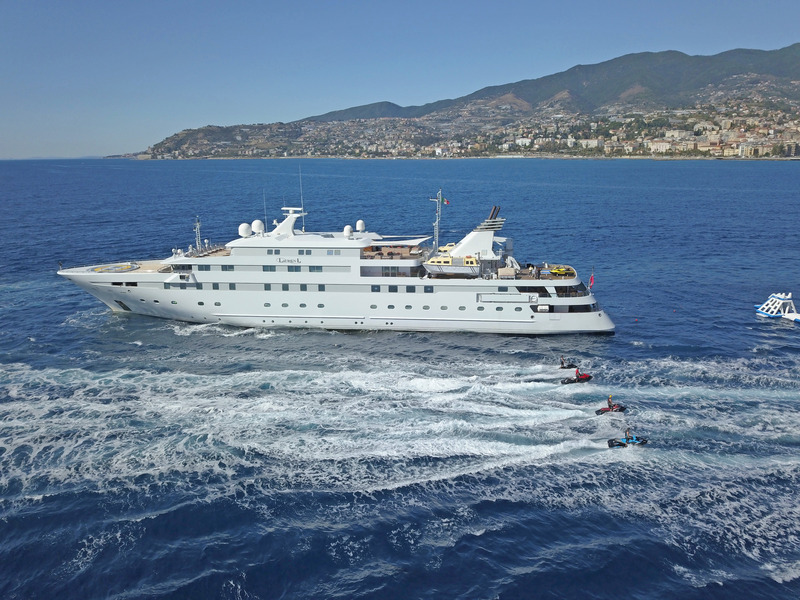 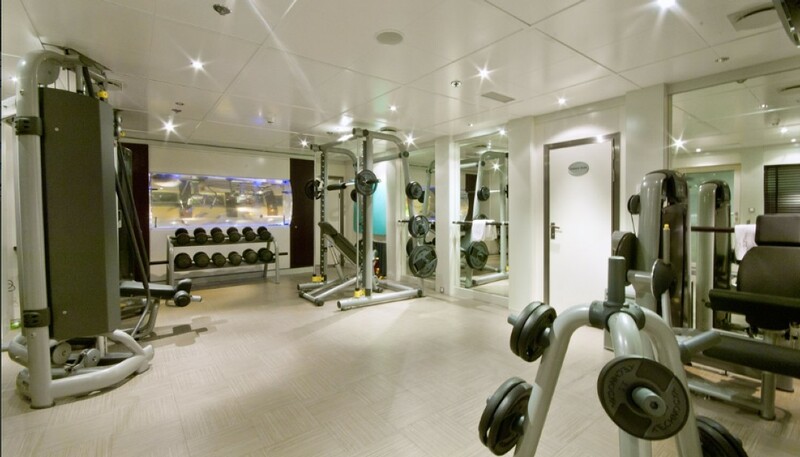 Above, the sundeck interior has a forward observation lounge and an aft gym with an impressive selection of equipment. 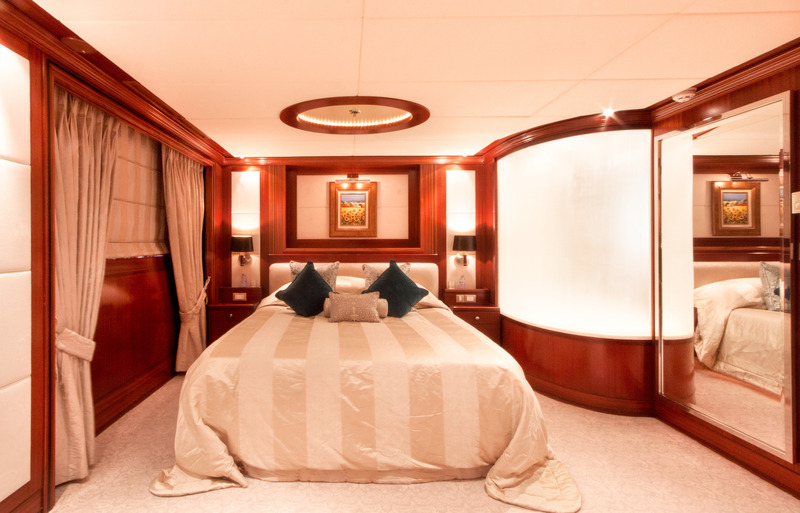 The accommodation sleeps up to 36 guests over 20 en-suite cabins: 1 Master suite, 1 VIP stateroom, 8 double cabins and 10 double cabins convertible to twins. 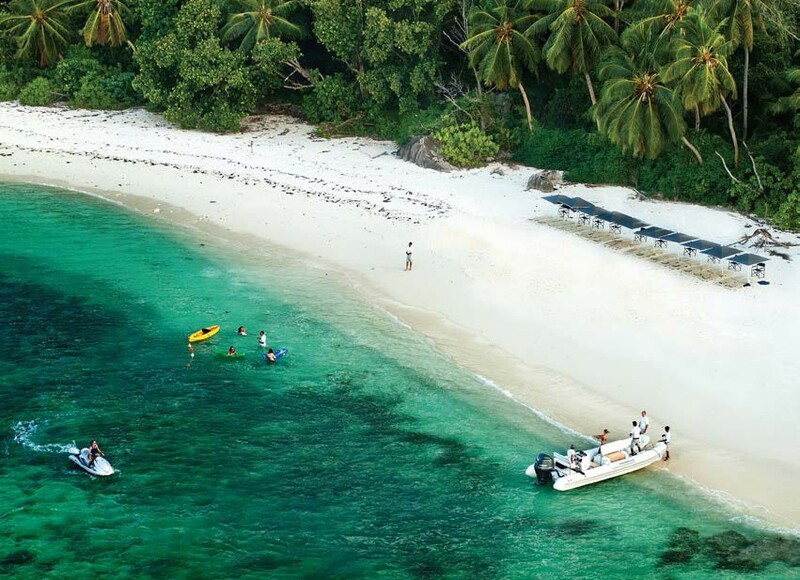 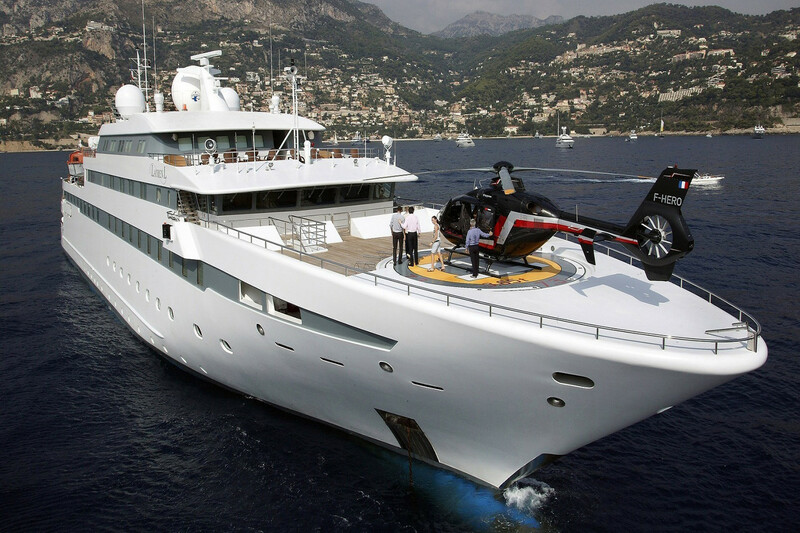 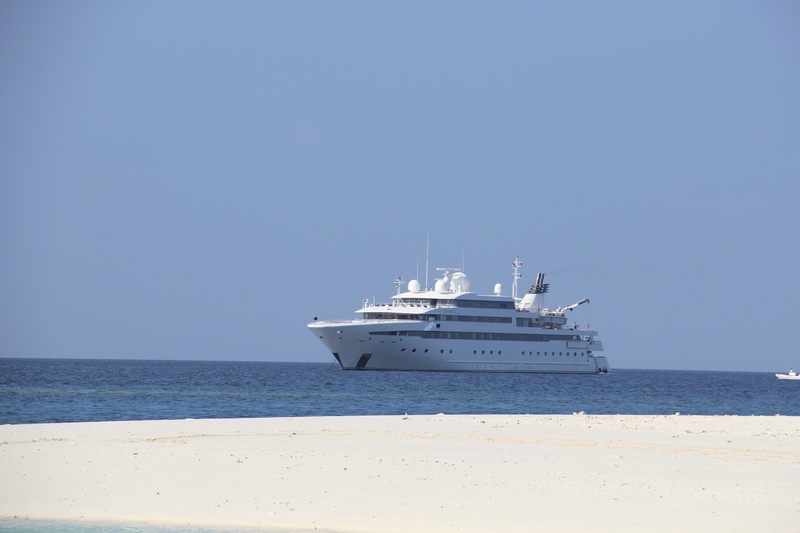 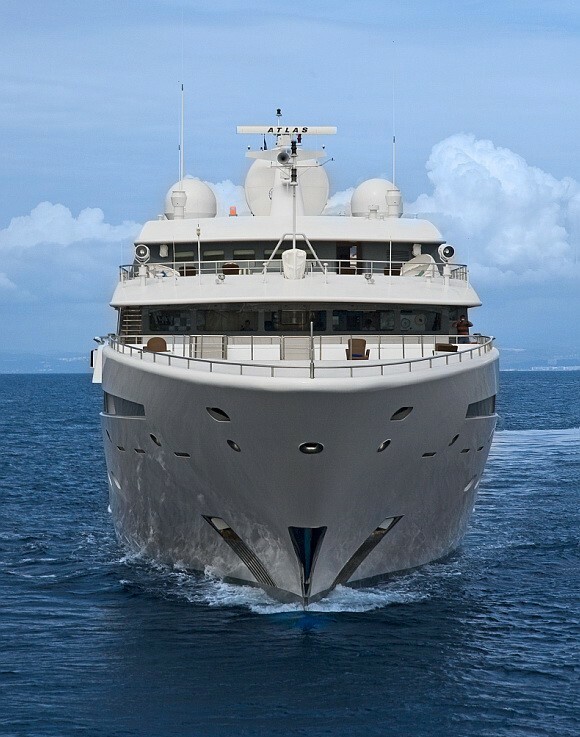 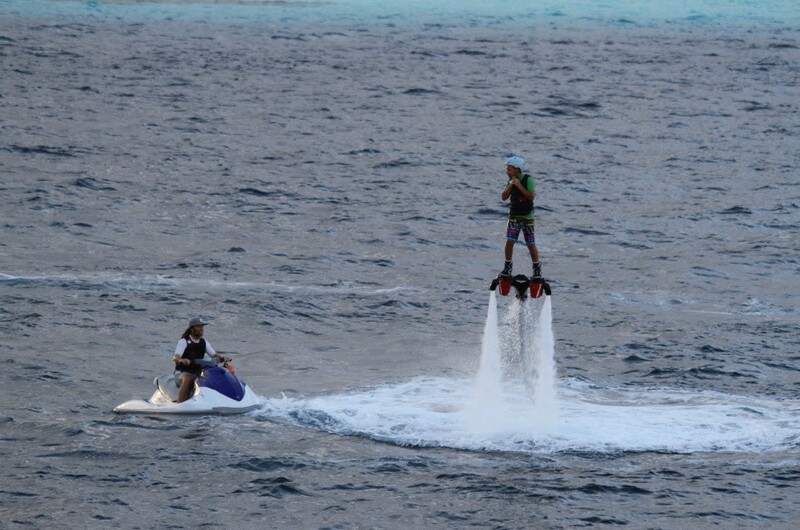 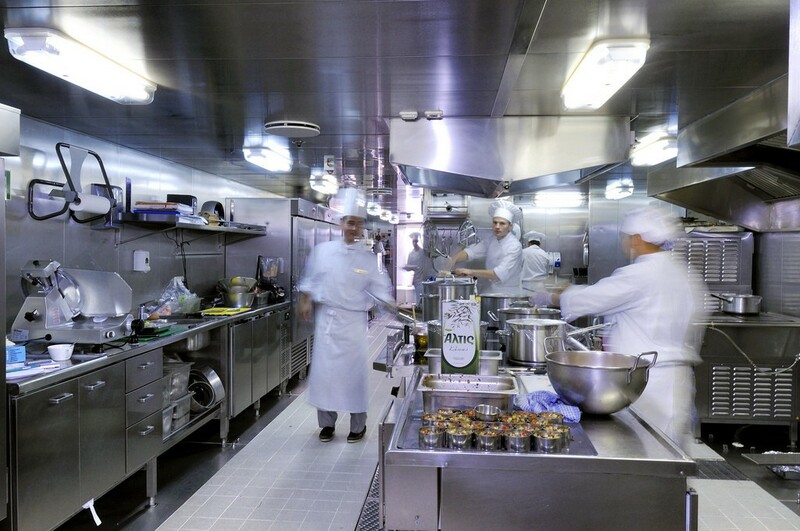 The crew of 40 will ensure that everyone on board receives first-class service.